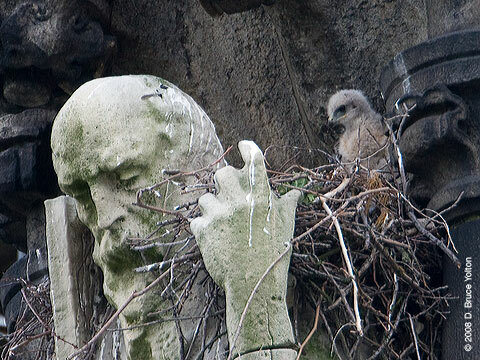 St. John the Divine nest is much more active. 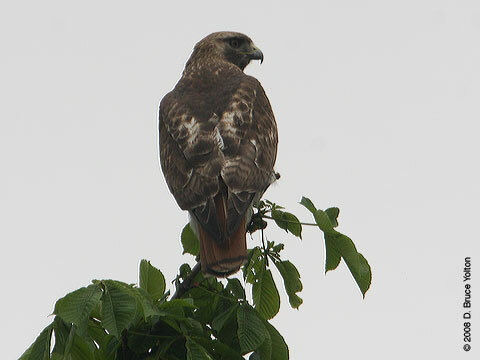 While it took hours of waiting earlier this month to see a glimpse of anything, it is now common to see at least one eyass when you visit. 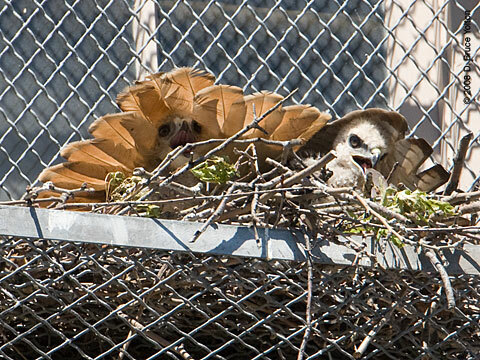 It makes watching them a lot more enjoyable. 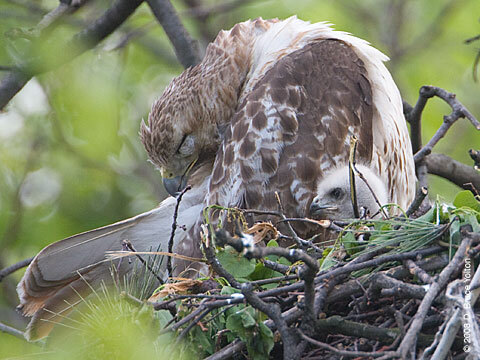 If you're in the neighborhood, take a detour and visit them. 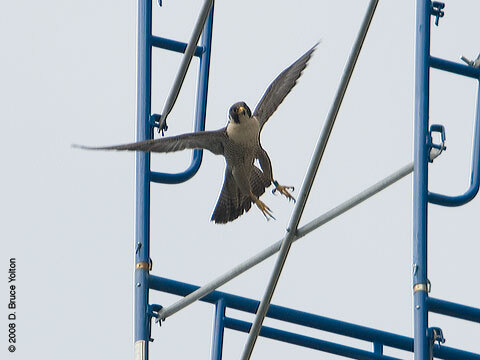 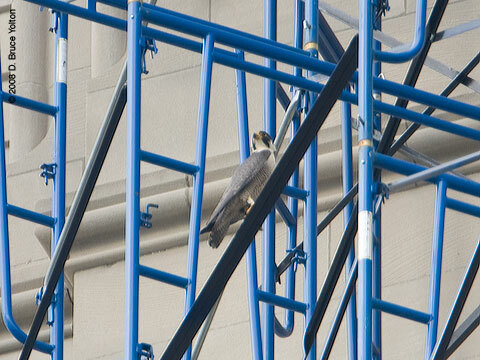 I went by Riverside Church to see if the resident Peregrine Falcons had any fledglings yet. 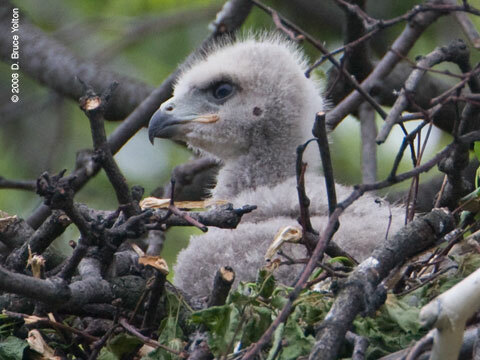 Since, I only saw the parents, I guess I was a week or two too early. 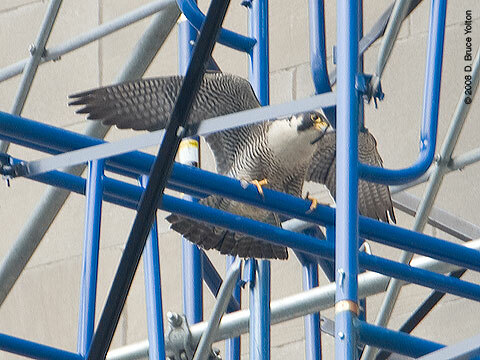 The parents were fun to watch as they weaved their way between the scaffolding. 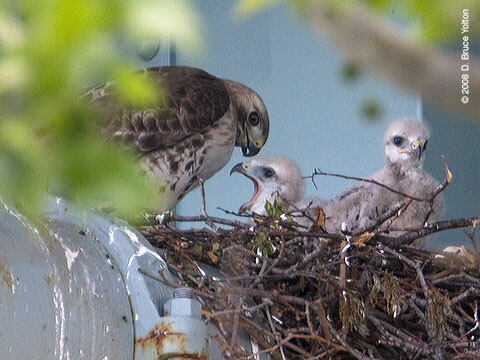 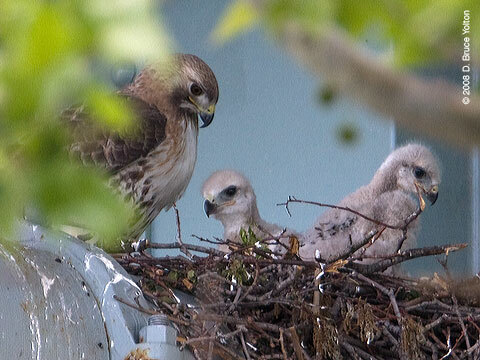 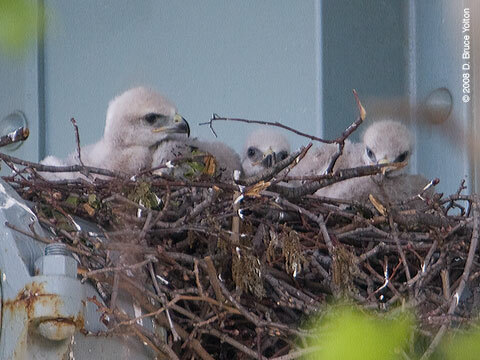 The three Houston street eyasses are looking more and more mature each day. 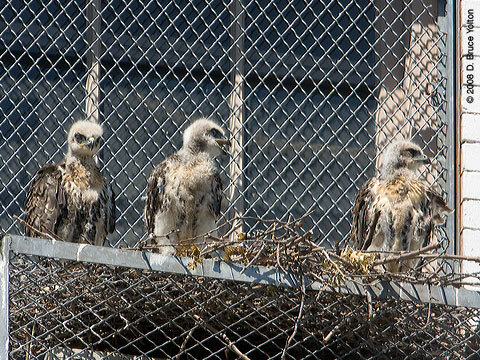 They look healthy and well attended to by their parents. 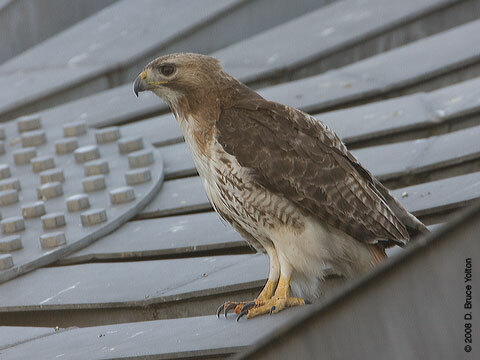 After learning of the City College nest on Shepard Hall, I've been taking a look at it ever few weeks. 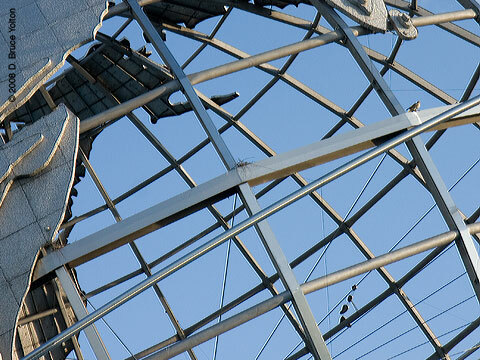 It appears to have been unused. 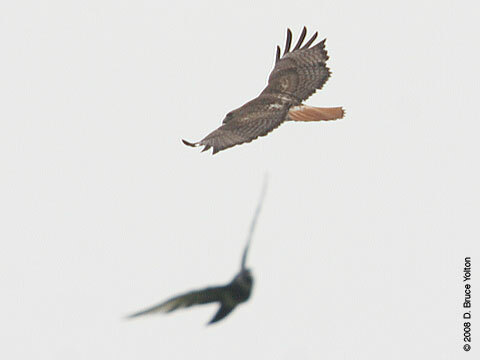 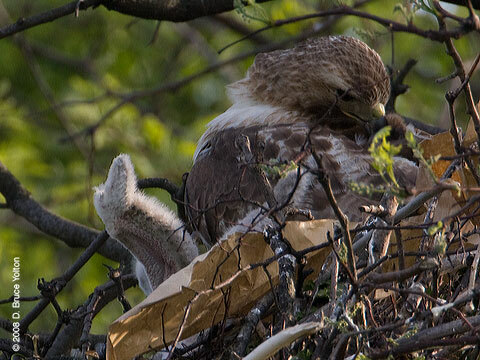 It's unclear if the pair had prepared the nest but used an alternate site or if the nest failed for some reason. 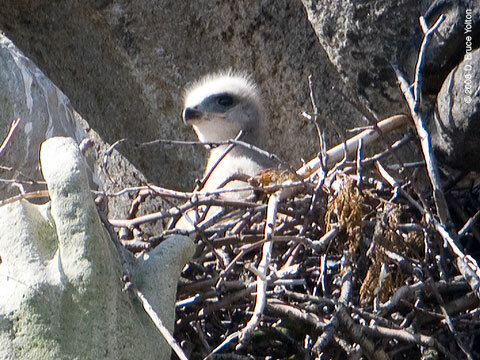 In any case here is a recent photo of the nest. 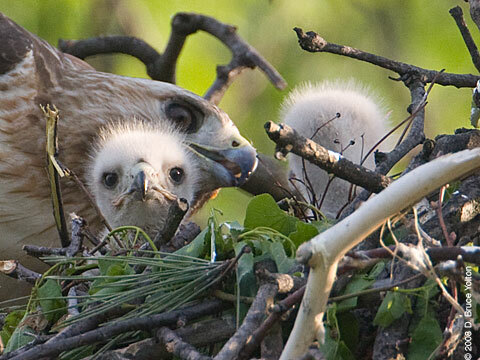 If it had eyasses in the nest, there would certainly be dirty by now! 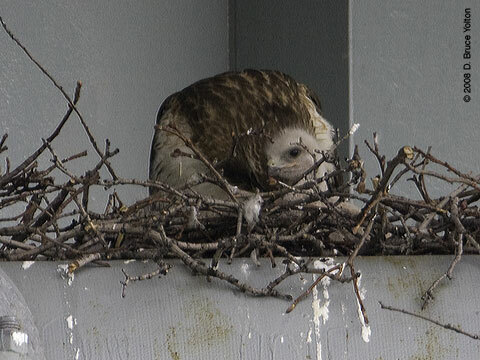 5th Avenue, nest failure. 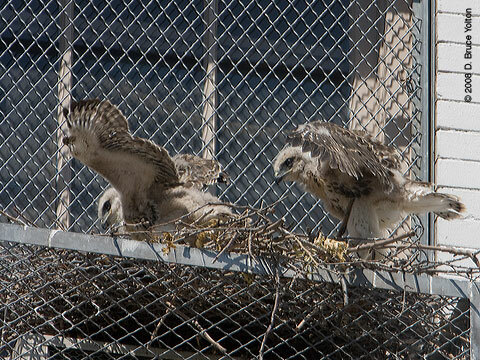 NYC Audubon is coordinating with the building to retrieve the eggs for testing when they do their window washing. 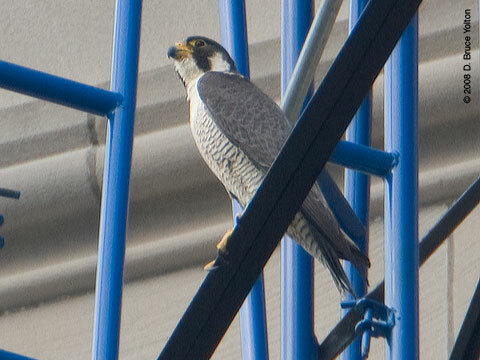 St. John the Divine, two eyasses visible. 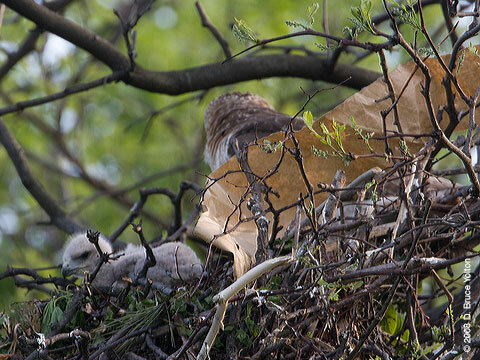 Highbridge Park, nest abandoned, two eyasses presumed to have died at about two weeks of age, reasons unkown. 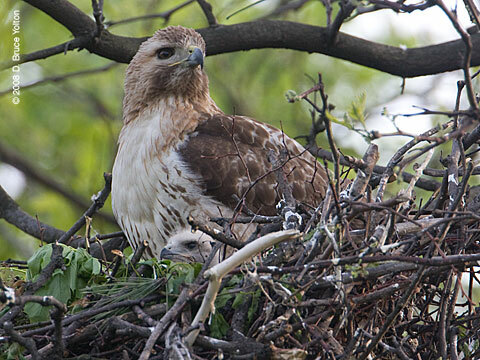 Robert Schmunk, James O'Brien and I have all spent time up at the nest over the last week and it has been abandoned. 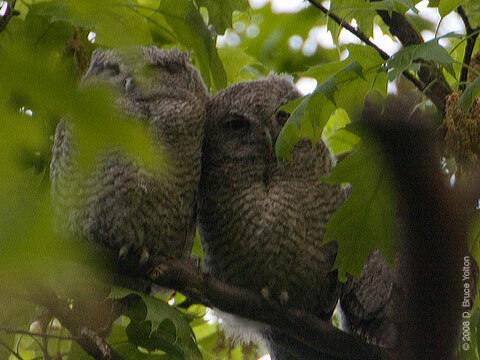 James O'Brien discovered the pair mating this weekend, so we've all agreed the nest has failed. 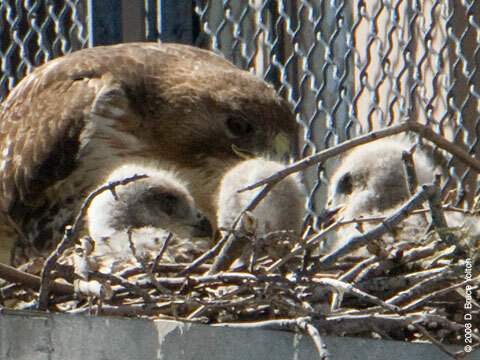 Inwood Hill Park, two or three eyasses depending on reporters. 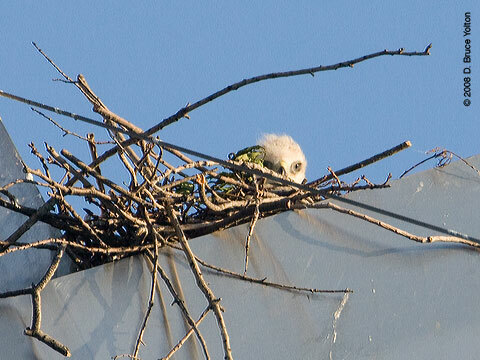 Nest is now surrounded by green leaves making it difficult to observe. 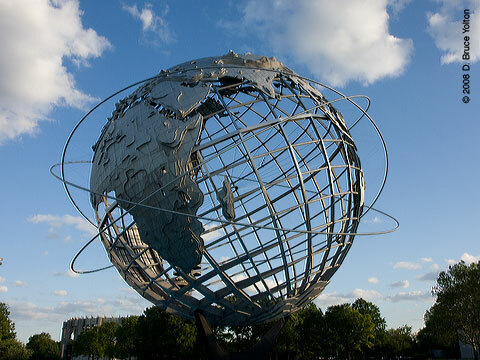 South Riverside Park,. 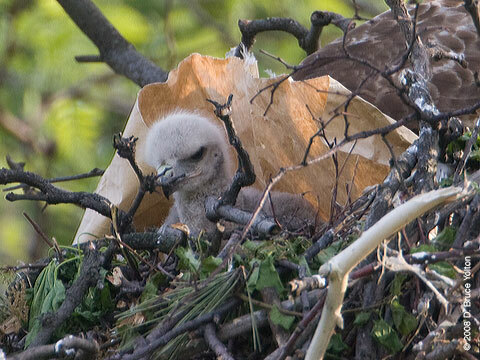 Parents have built a new nest. 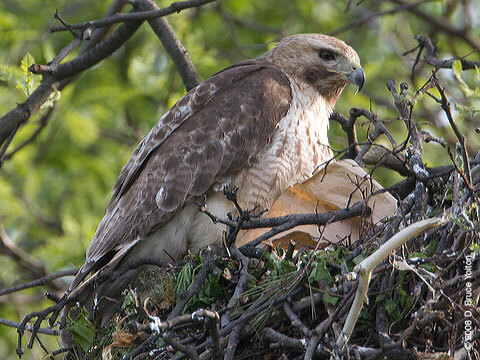 It is uncertain if they will lay eggs this year, or wait until next spring. 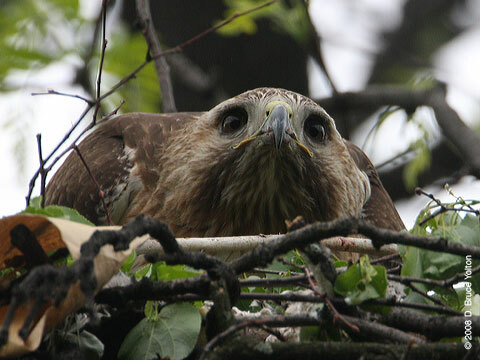 Toxicology reports due for the second and third eyasses soon. 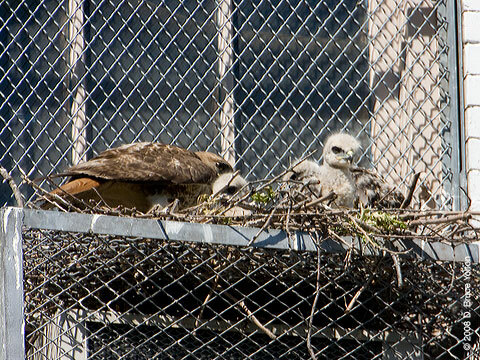 Shepard Hall, City College, nest is too difficult to observe to be sure. 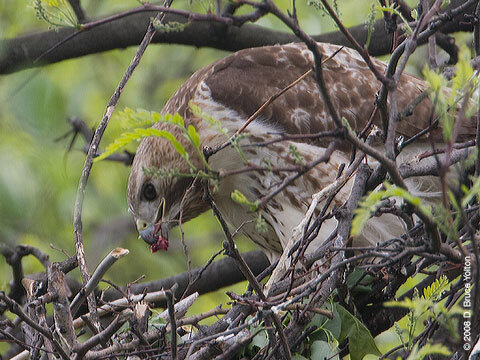 Update 5/28: I had confused a note from James O'Brien about where copulation had occurred. 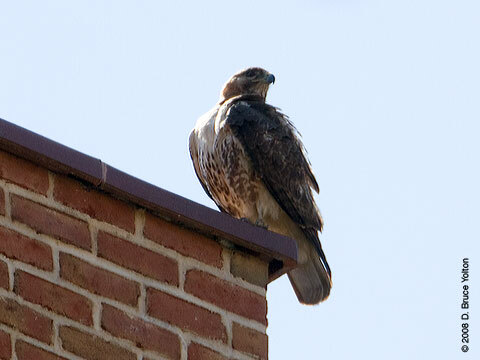 It was at Highbridge, not City College. 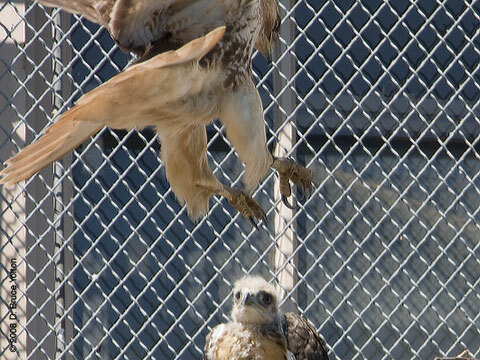 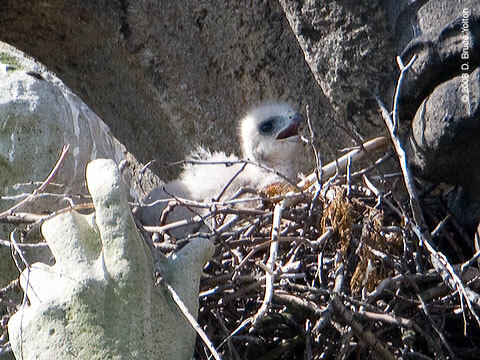 So, behavior still makes the nest look active with hatched eggs, however there has yet to be a sighting of an eyas. 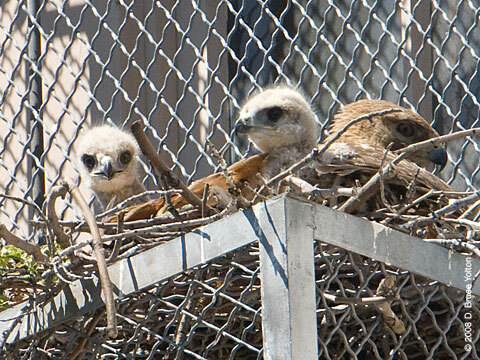 The Houston Street family is doing well. 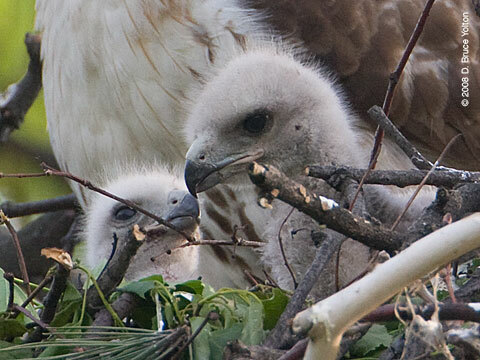 There are three eyasses. 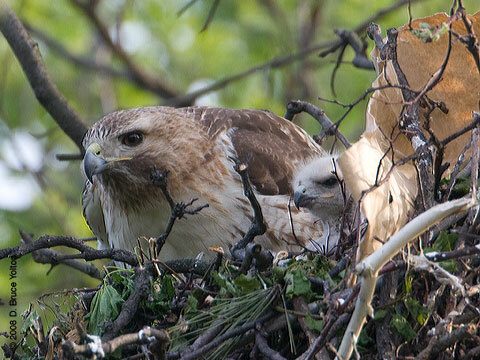 When I arrived the adult female was using her tail and wing feathers to provide shade for her offspring. 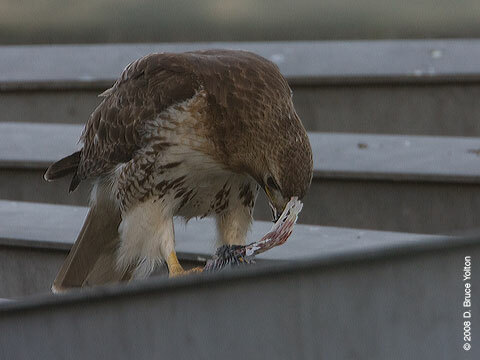 They ended up being restless and after about twenty minutes, she feed them. 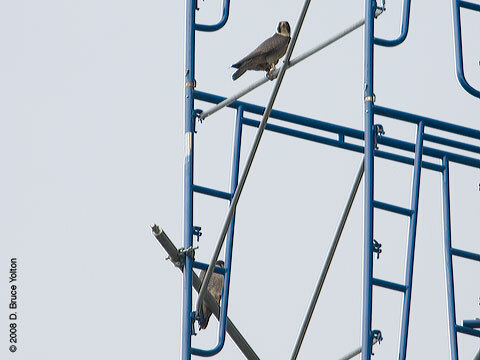 I got a message from Lincoln Karim that the Triborough Bridge pair was actually a trio, so I went out Saturday afternoon. 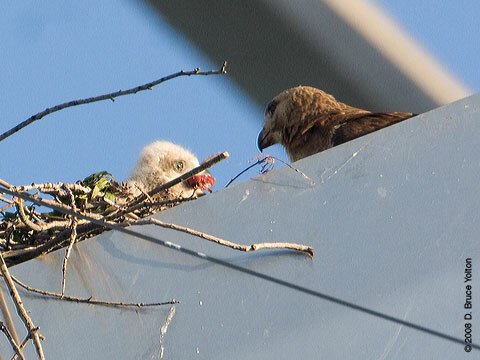 I got to see the eyasses and the mother. 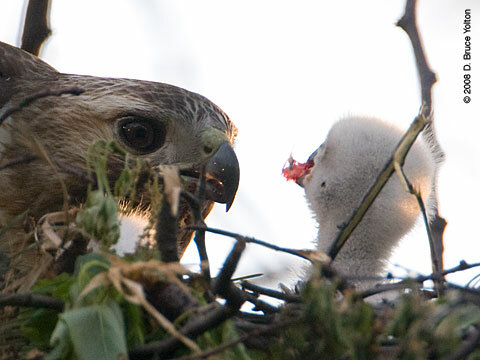 The mother had been sick and was restored to good health under the care of Bobby Horvath. 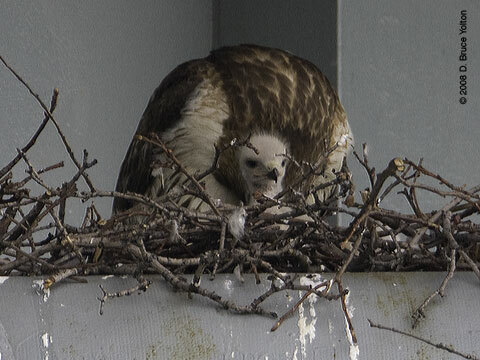 You'll see she's banded. 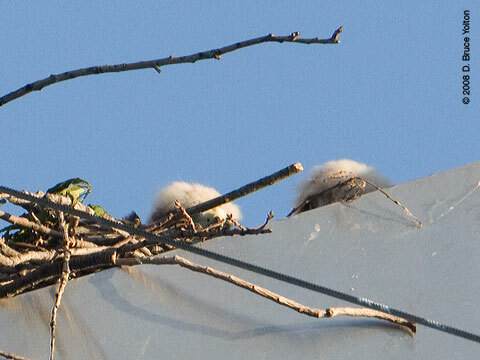 The nest is now very difficult to view due to leaf cover. 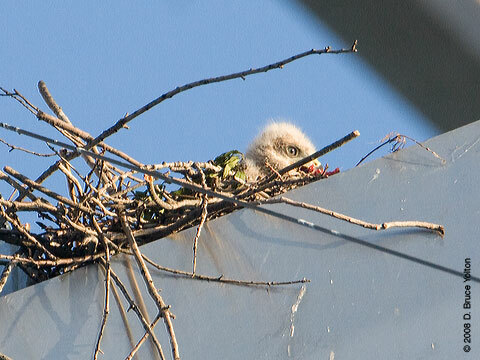 I tried to get pictures from at least six angles and just got lots of green! 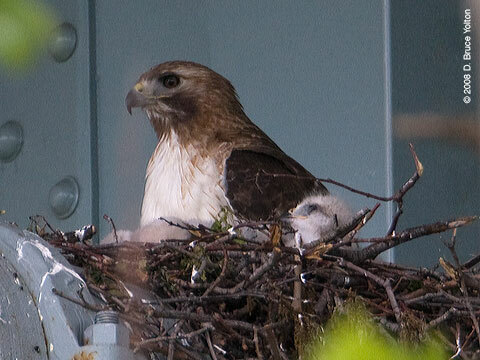 I saw at least four visits from the adults, so I suspect all is well. 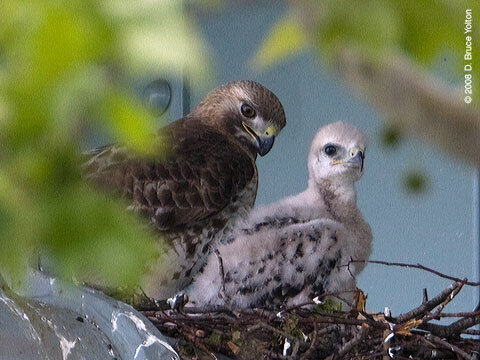 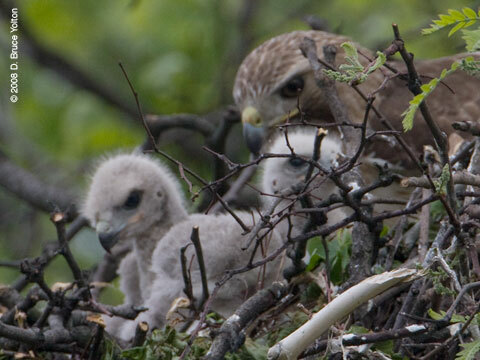 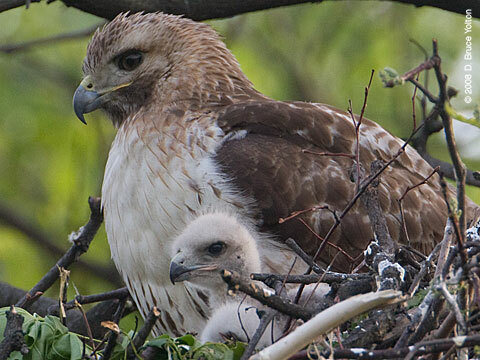 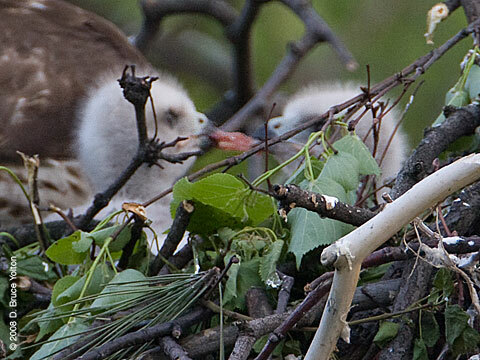 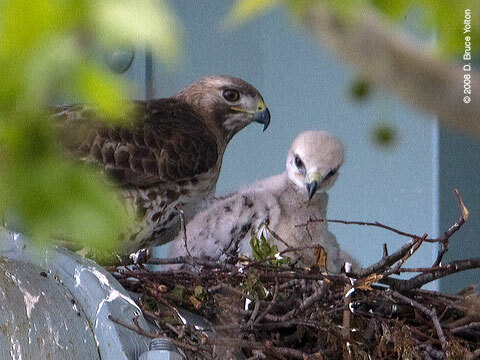 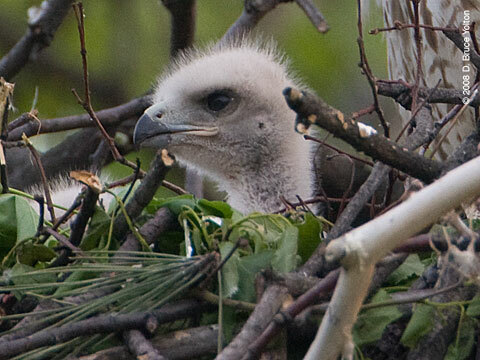 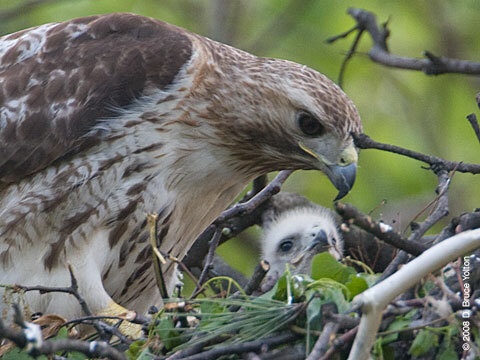 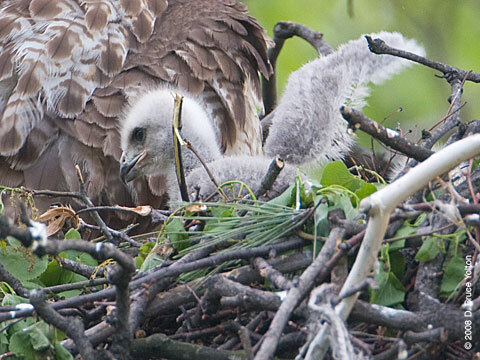 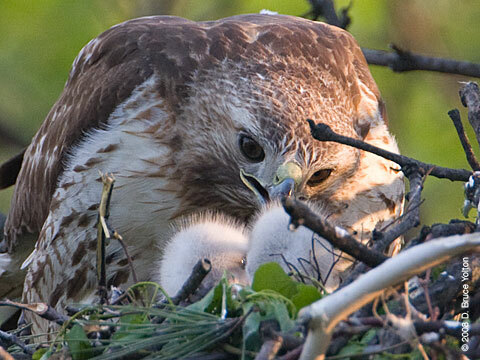 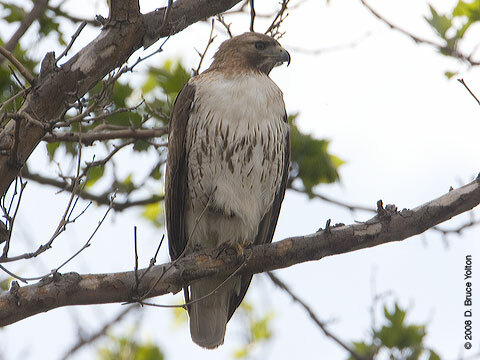 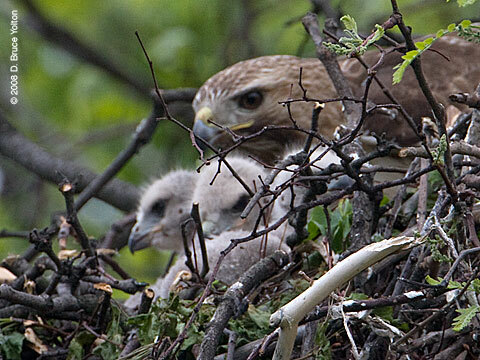 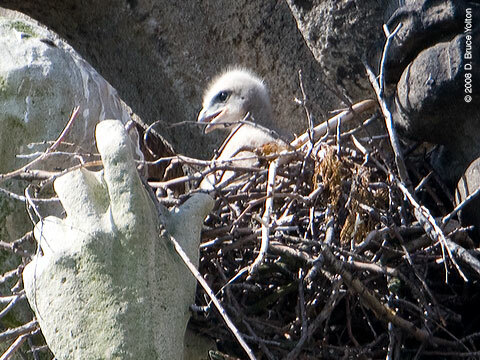 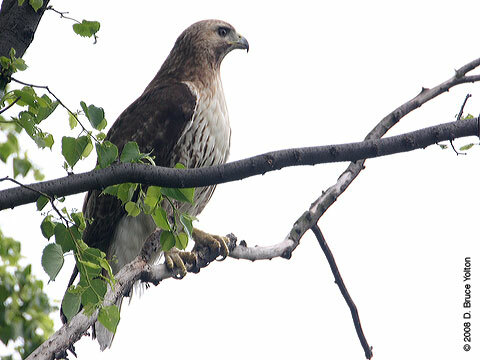 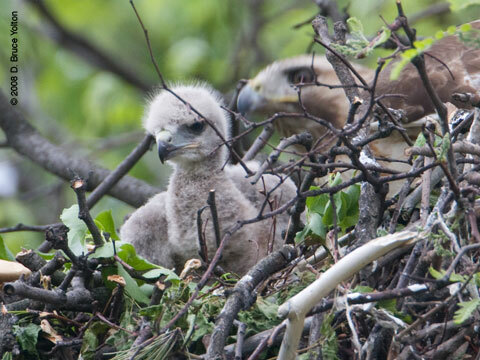 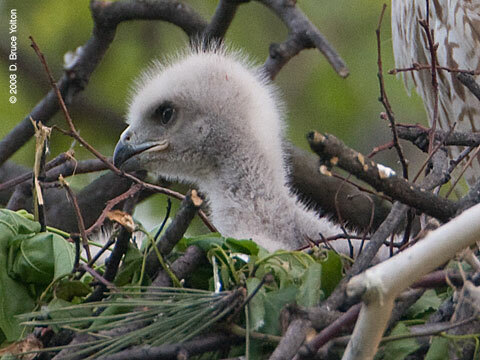 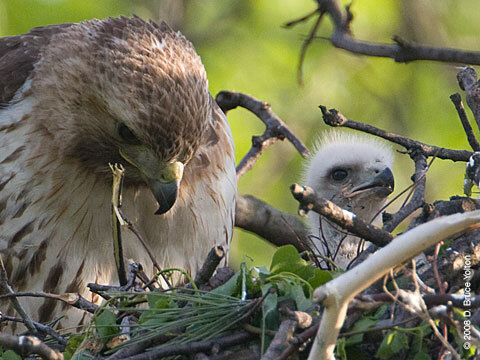 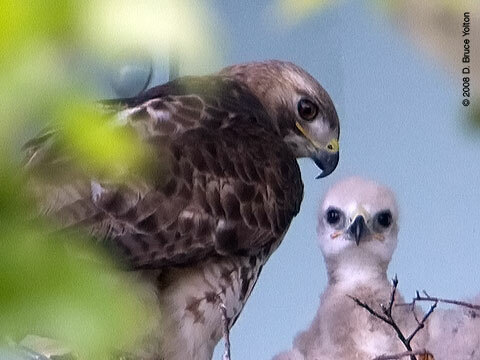 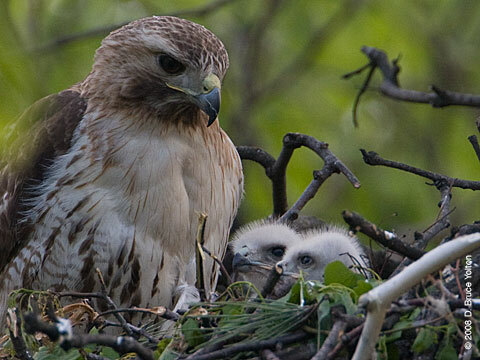 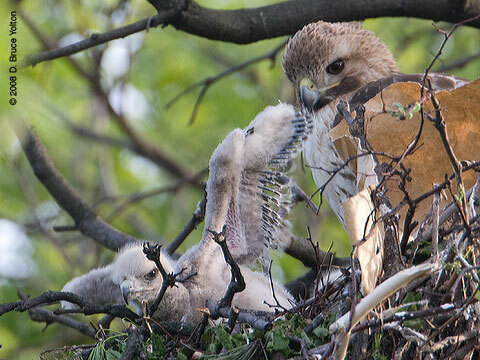 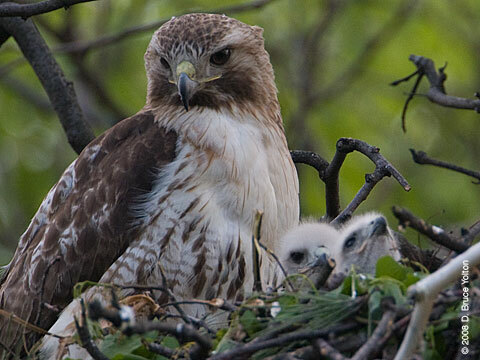 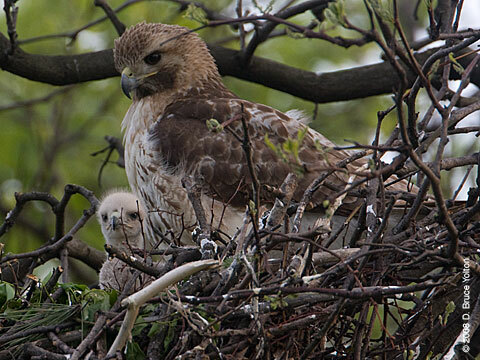 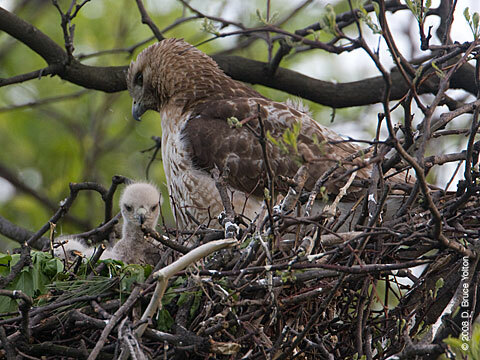 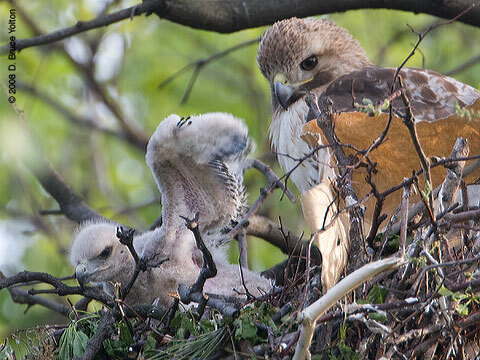 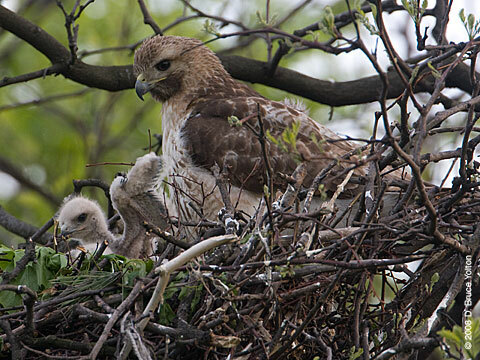 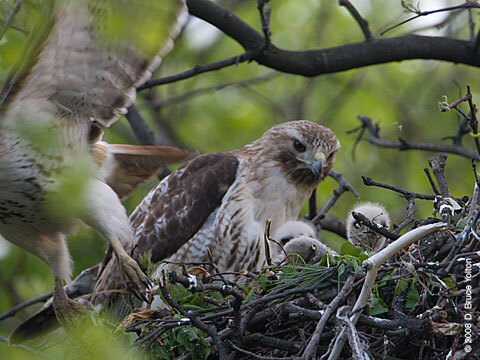 The Inwood Hill Urban Rangers report seeing two chicks. 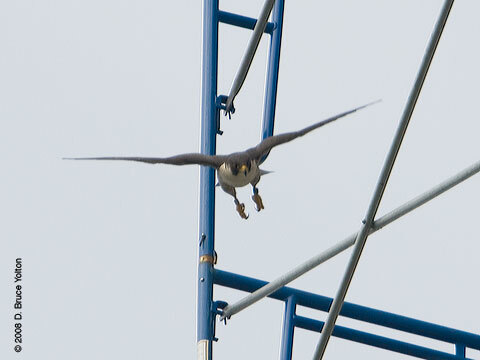 I did get to take a series of pictures of one of the adults over a soccer field. 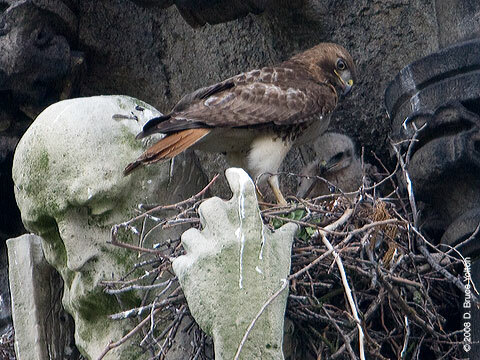 This season has had its problems up at St. John the Divine. 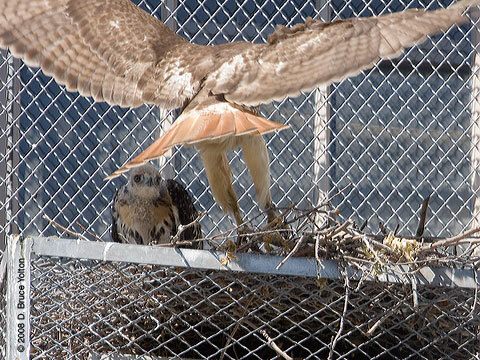 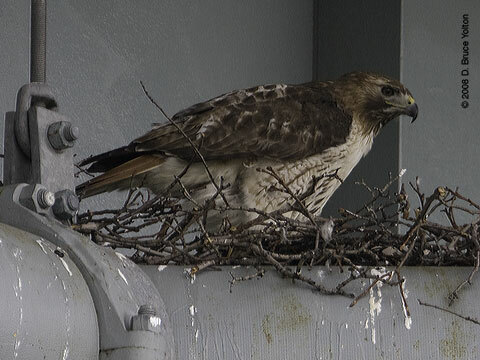 The male of the pair died and was replaced by a younger hawk, and there has been repair work on the roof right by the nest. 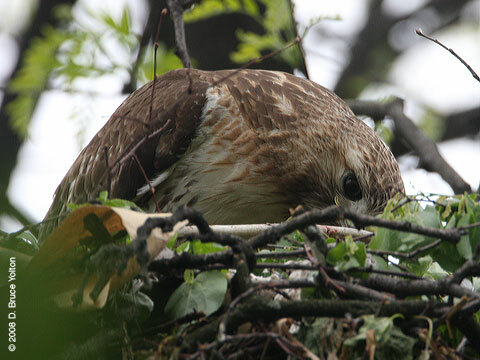 Unlike many of the other New York City nests, we can't see the eyasses until they are about two weeks old due to the height of the nest. 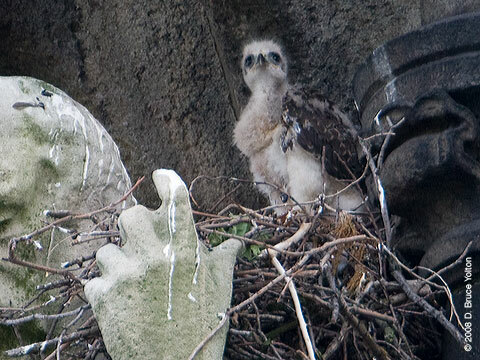 So, with a new father and construction, there were lots of worries that we hadn't seen anything yet. 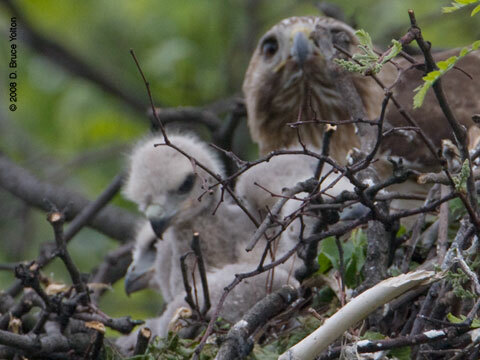 So, it was with great joy that the eyasses were finally sighted over the last few days by Robert and Lincoln. 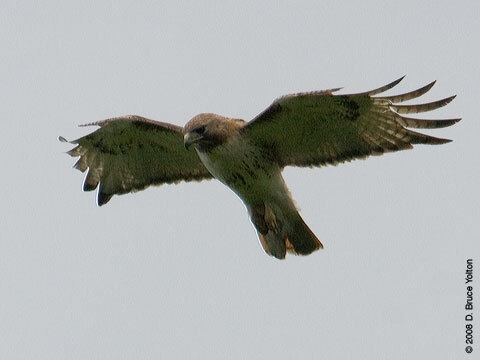 I had gone up on Thursday and didn't see them but was rewarded on Saturday morning. 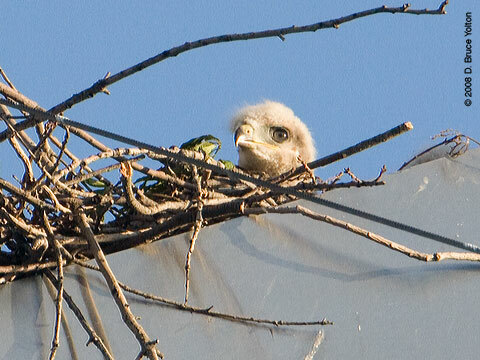 There appear to be two eyasses. 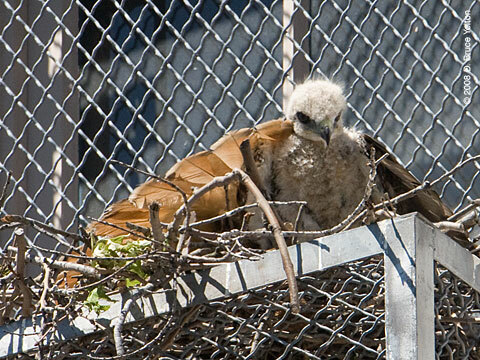 Thanks to a text message from Lincoln Karim, I went out to the Unisphere in Flushing Meadows, Queens and was able to find the new Red-tailed Hawk nest location. 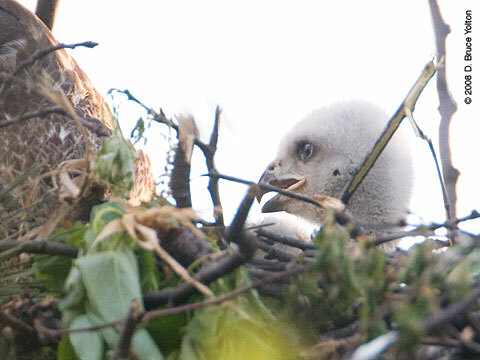 It is about minus 30 degrees of longitude from the old nest. 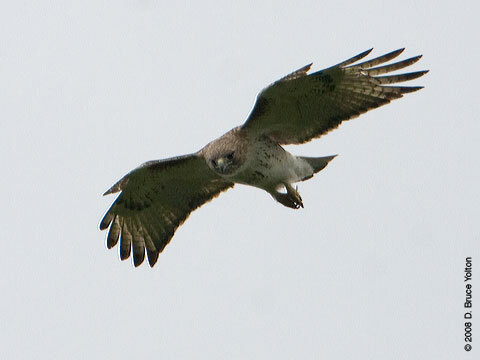 Instead of being near Indonesia, it is now in the Indian Ocean off the coast of Somalia. 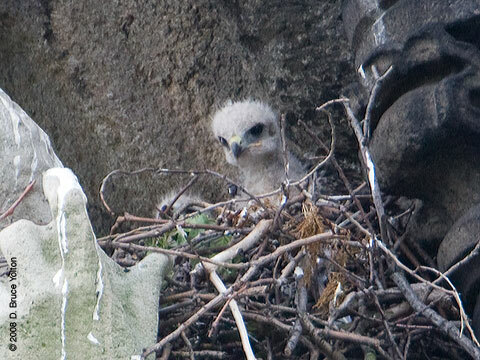 I had received reports earlier in the season that the nest site was empty. 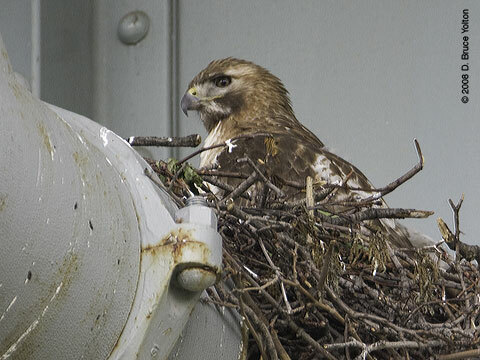 The nest is in an I-beam, so it must be easy for the mother to hide while brooding and for the eyasses to hide when they are young. 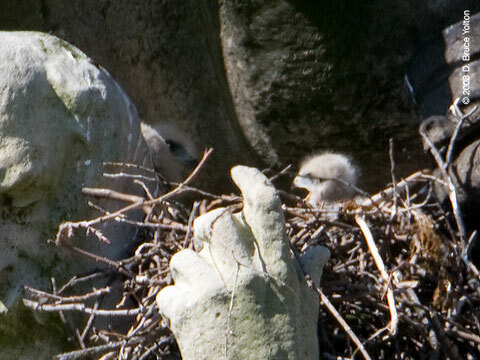 There are at least two chicks in the nest. 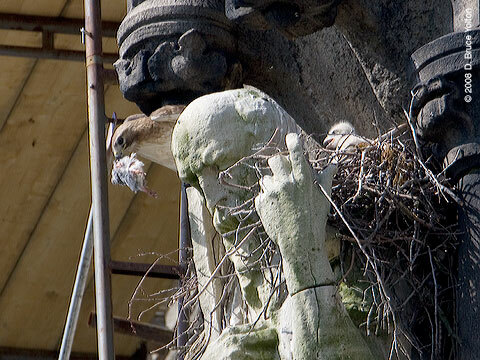 In the pictures that follow, the mother captures, eats and feeds a young pigeon to her eyasses. 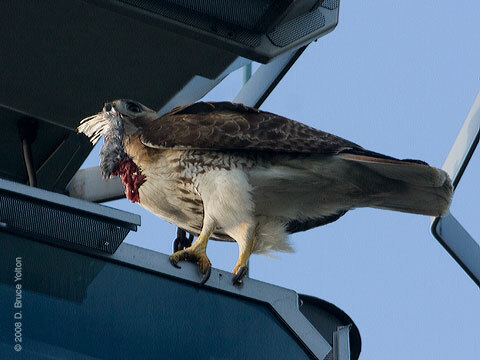 Readers beware. 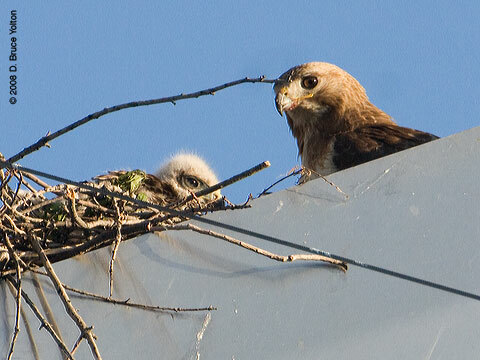 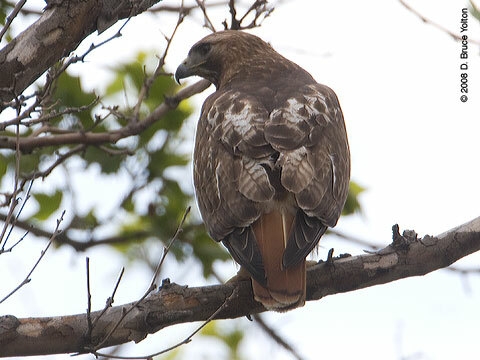 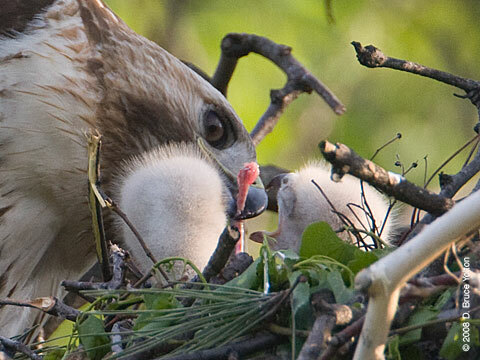 On the left, East Africa, the nest is in the center, and the adult female is on the right. 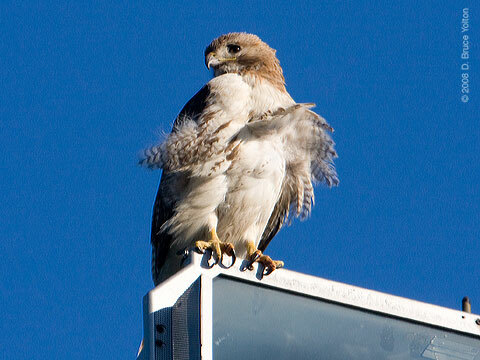 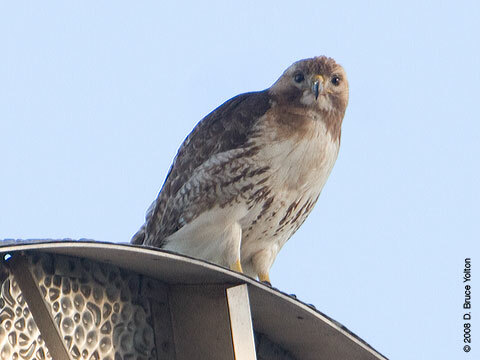 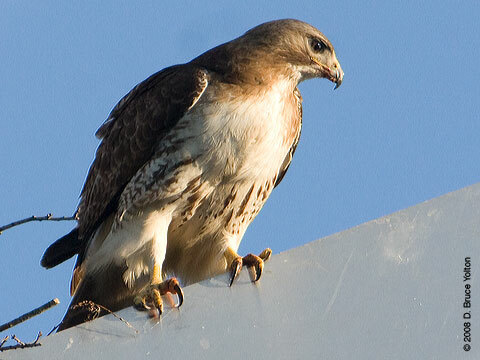 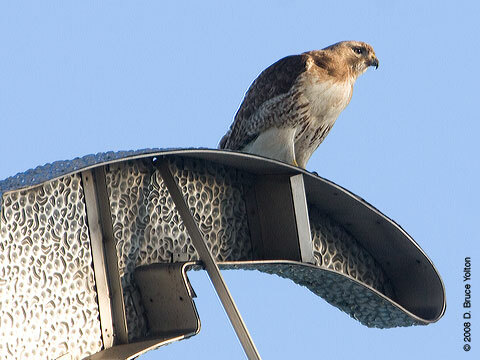 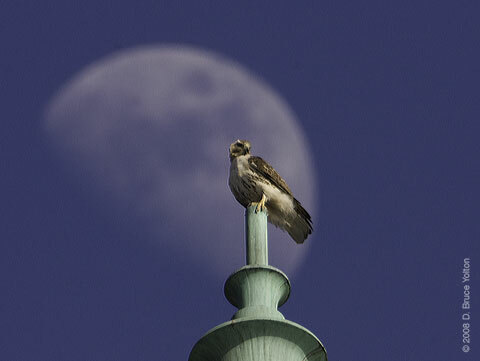 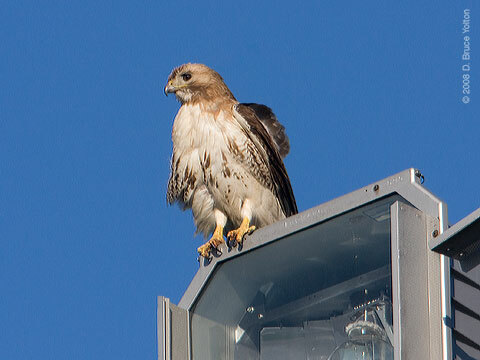 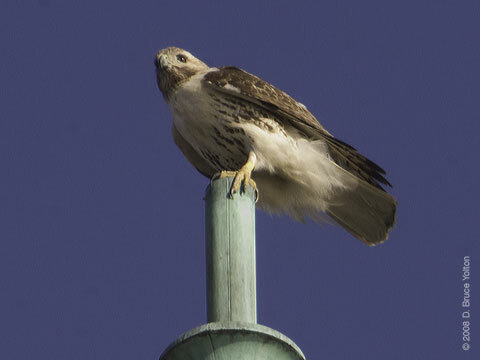 The adult female perches on a light around the perimeter of the Unisphere plaza. 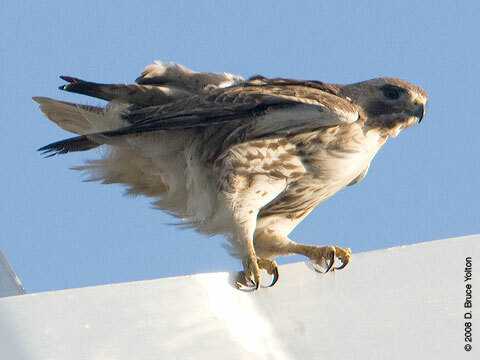 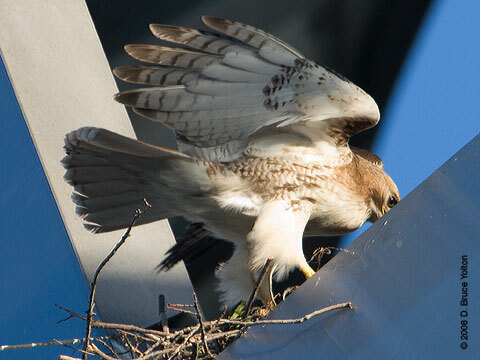 The adult female hunts at the bottom of the Unisphere. 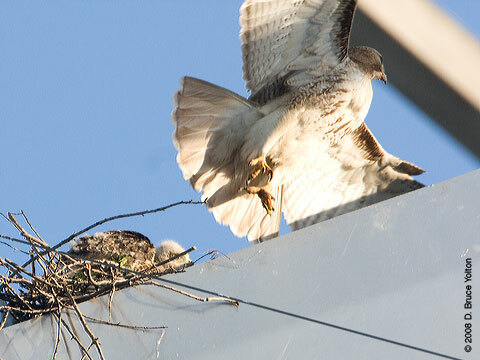 There are a number of nesting pigeons, and she grabs a juvenile pigeon. 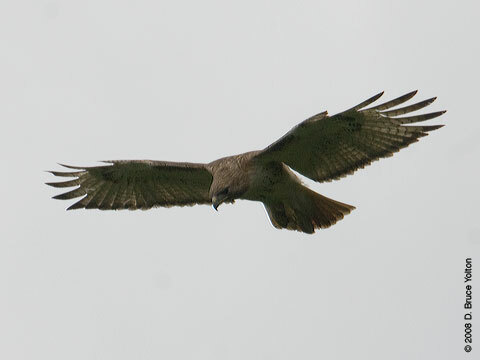 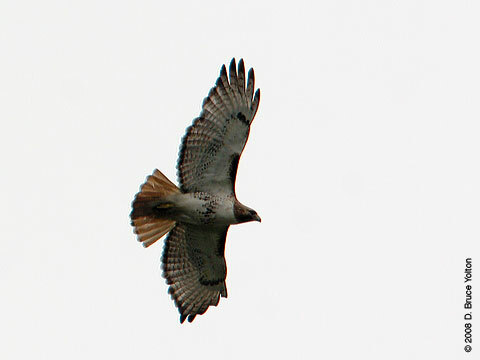 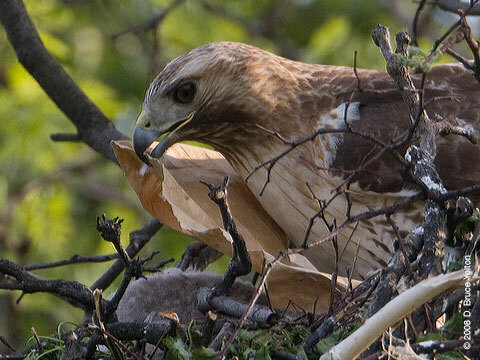 After eating a great deal, she takes a piece to the nest after a few stops to gain altitude. 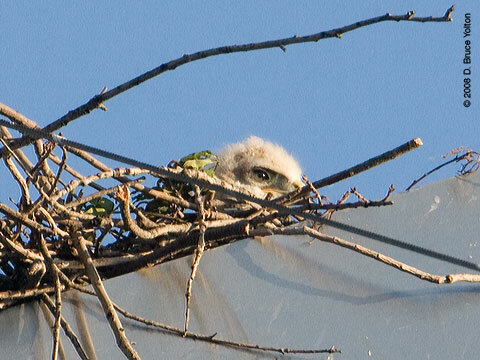 My first sighting of an eyas. 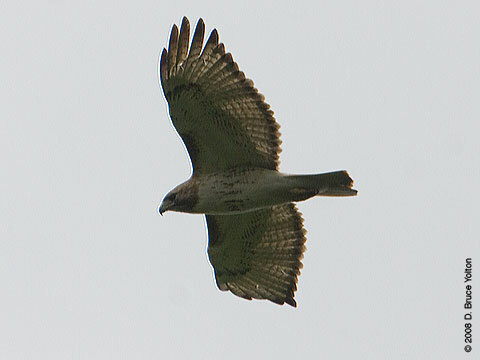 The adult female on Cuba. 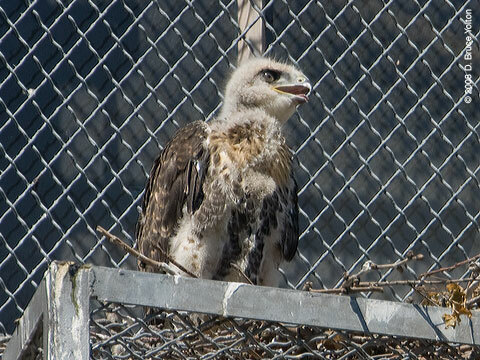 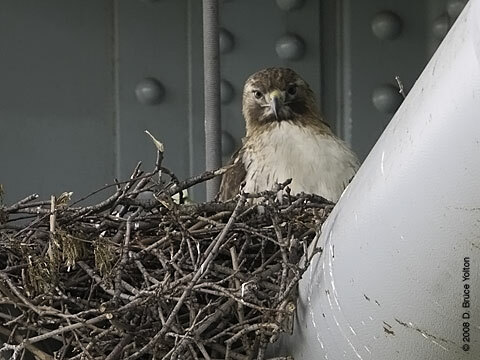 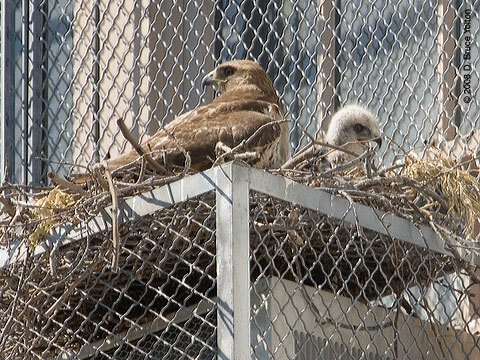 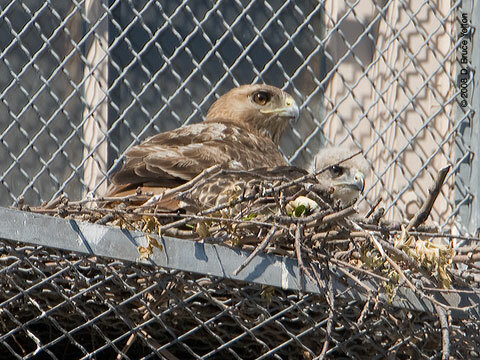 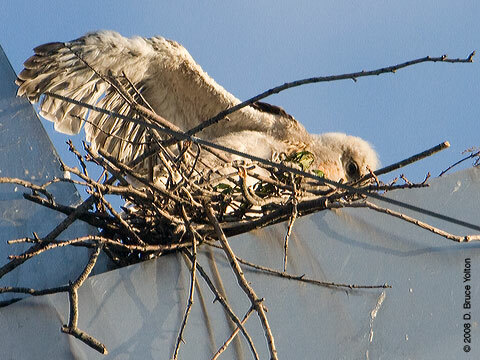 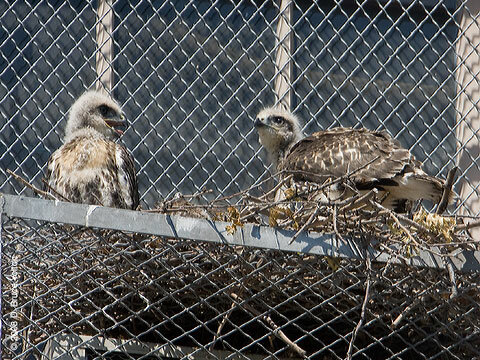 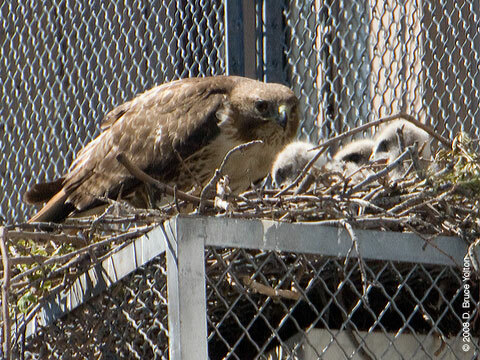 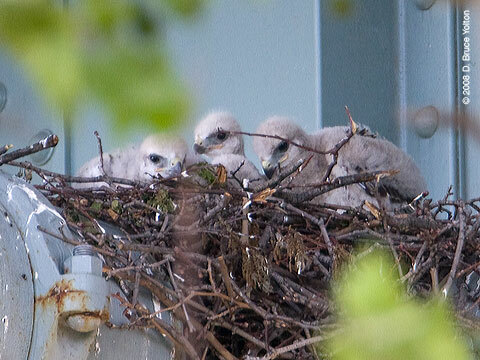 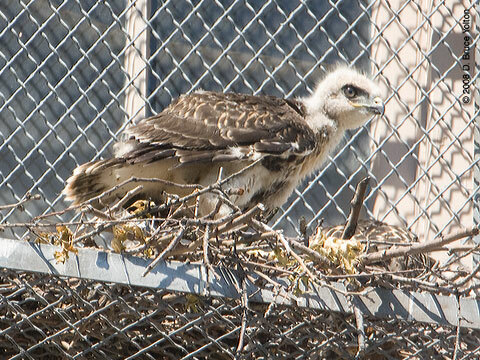 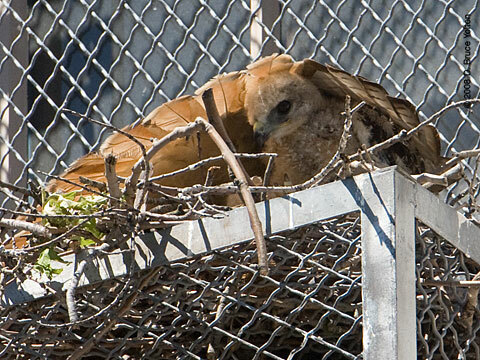 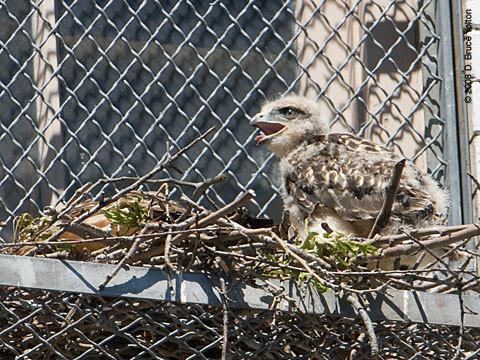 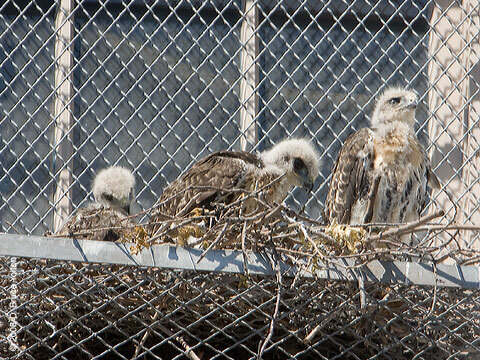 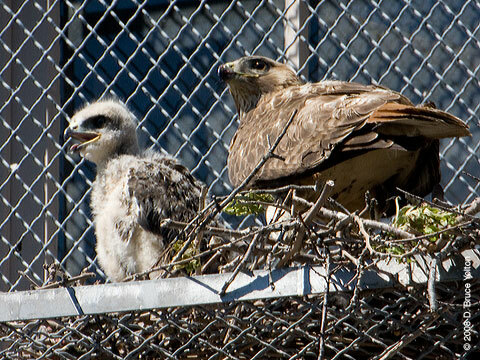 The Astoria/Triborough Bridge nest has at least two chicks in its new location on the other side of the bridge. 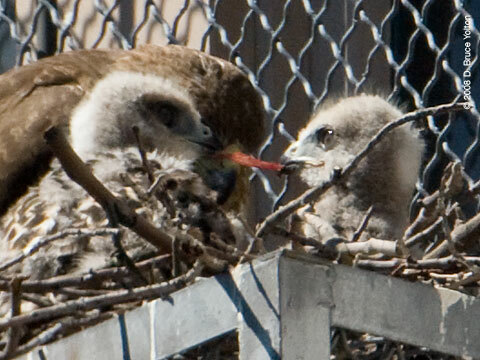 (Thanks, Jules Corkery for the update.) 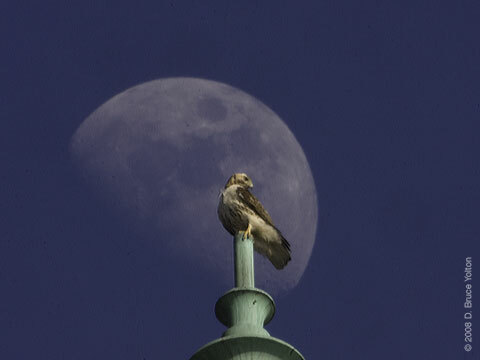 I didn't get great pictures this evening but wanted to share them never the less. 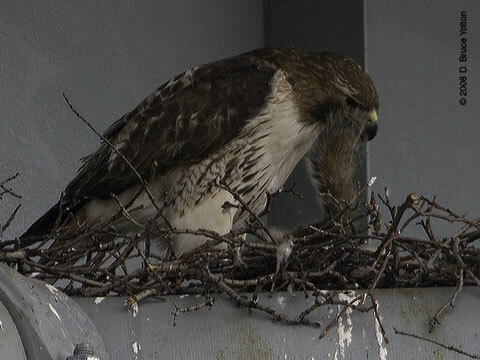 The Astoria female was very ill this fall and was nursed back to health under the care of Bobby Hovarth. 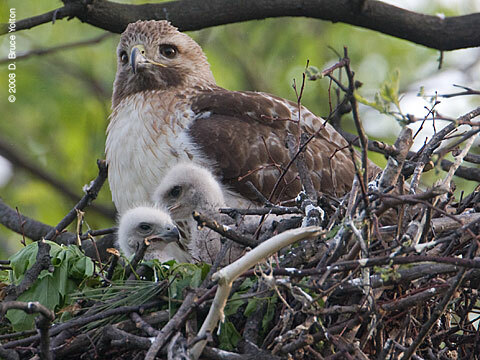 With all of the bad news, it's important to remember that there are still lots of positive stories and successes in New York City. 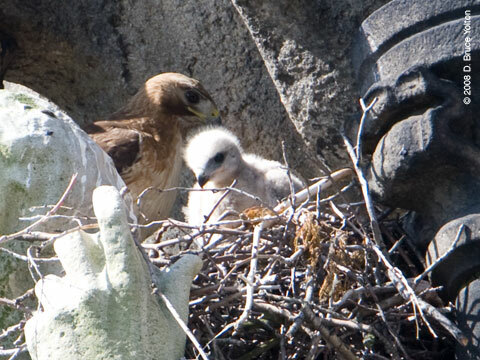 Update 5/15/08: Also on the good news front Peregrine Falcons are doing well this season. 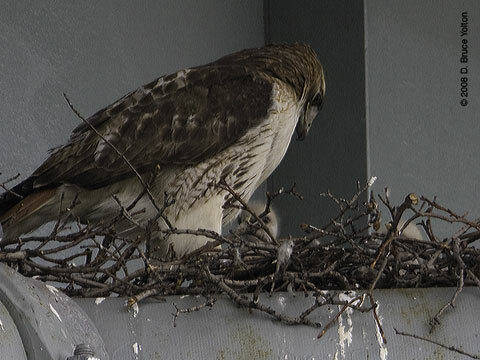 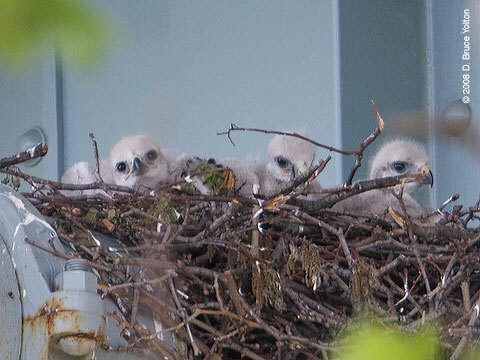 55 Water St. has a scrape with four nestlings which can be viewed on a webcam, and at least two birds have fledged on the Met Life building. 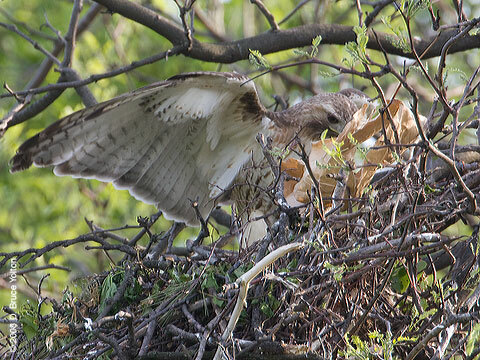 This morning, the Riverside Red-tailed Hawk nest fell down. 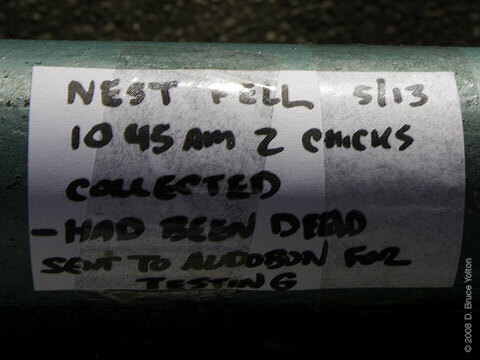 A sign posted to a railing near the nest stated that the nest fell at 10:45 a.m. and two eyasses were recovered and set to Audubon. 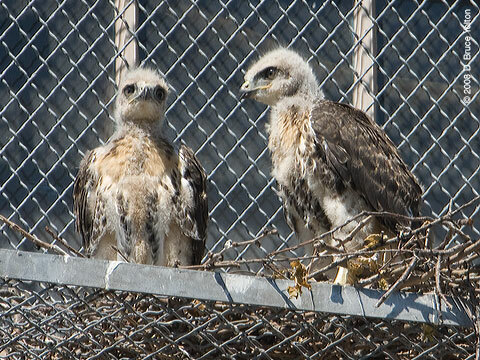 The toxicology results of the first eyas recovered should be returned in about two weeks. 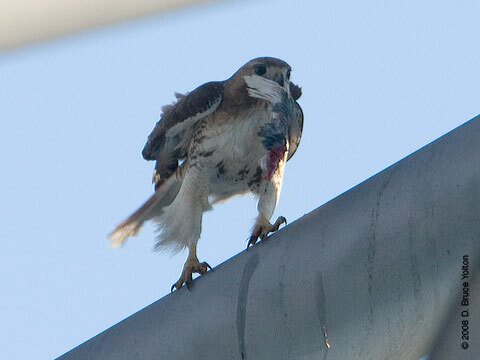 This will help determine what occurred last Friday. 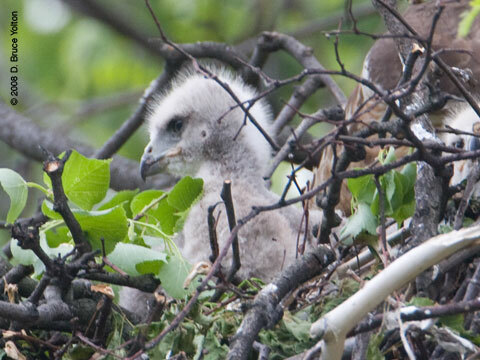 Both parents were on the The Normandy at 140 Riverside Drive this evening. 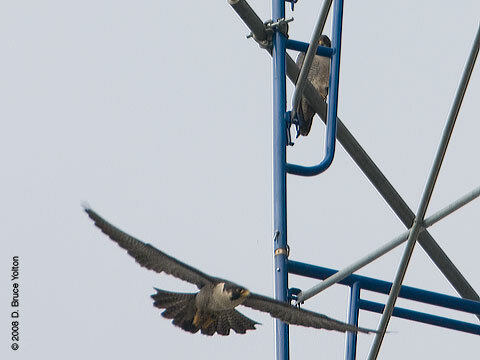 One on each tower. 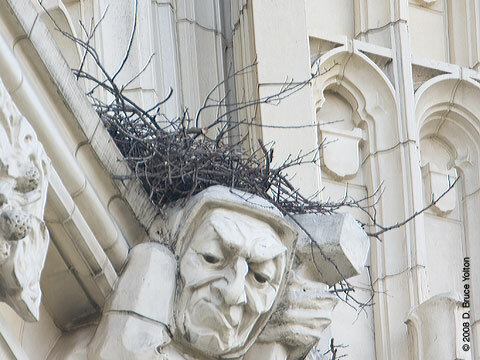 5th Avenue, nest failure. 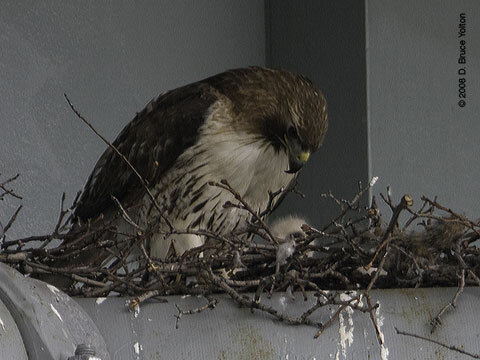 Lola has stopped sitting on the eggs. 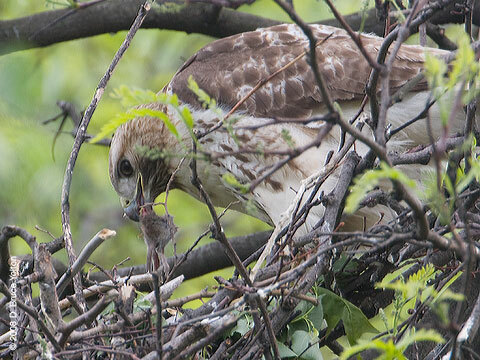 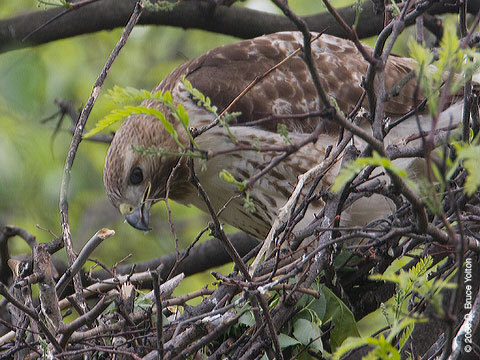 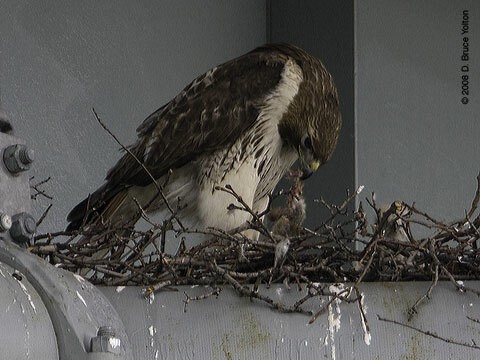 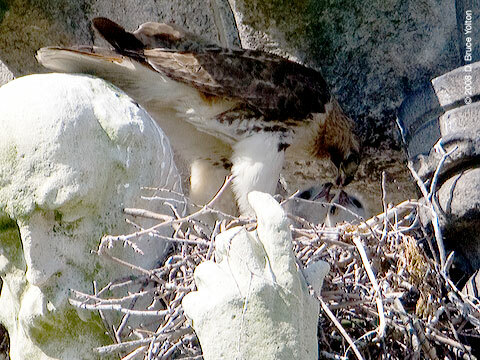 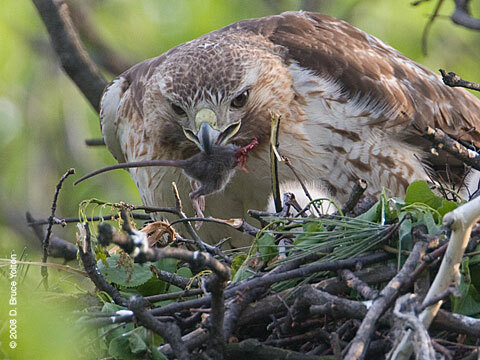 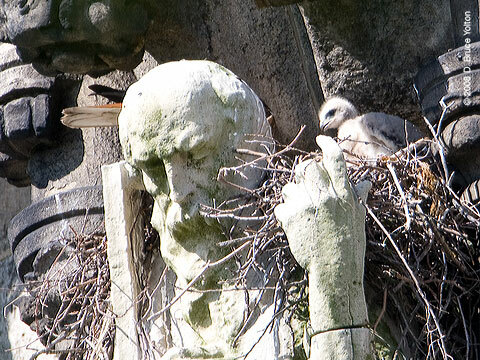 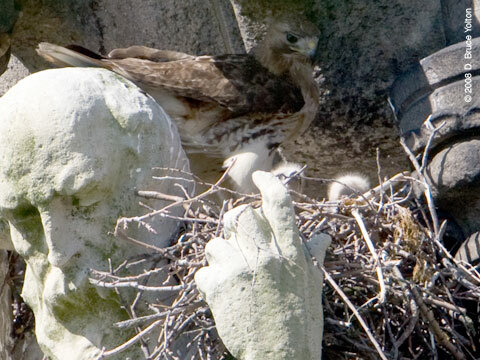 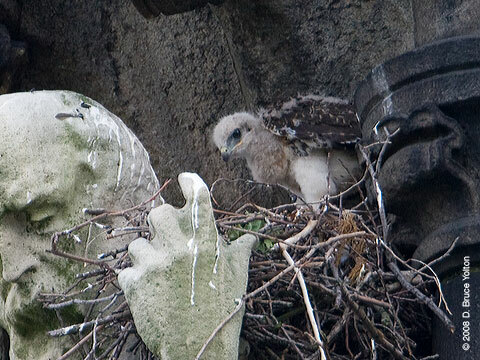 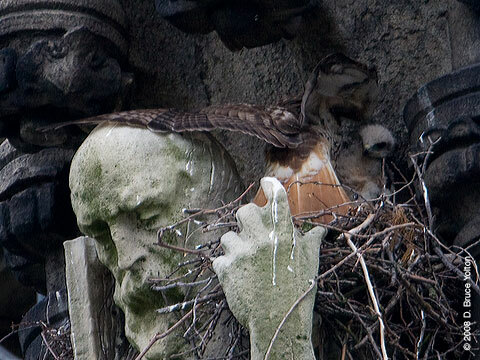 St. John the Divine, feeding behavior has started, but no eyasses visible, which isn't unusual for this nest. 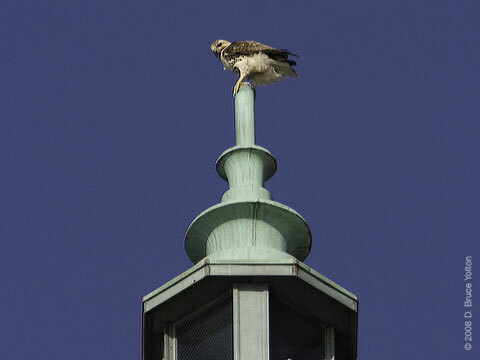 Shepard Hall, City College, nest is too difficult to observe to be sure. 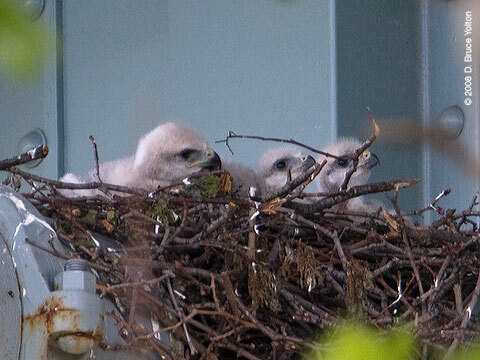 On Saturday, after a severe spring rain storm on Friday, there were no sightings of the eyasses and very erratic behavior from the parents. 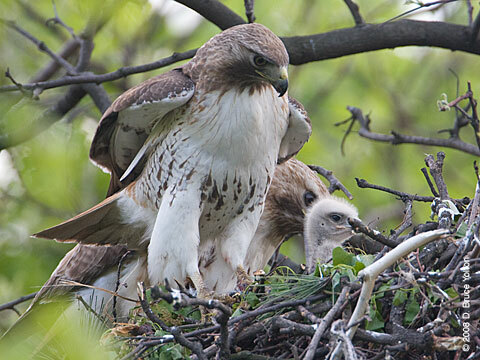 The parents spent a great deal of time off the nest and flying to nearby trees. 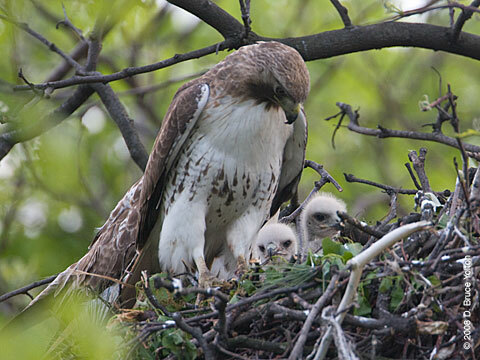 On at least two occasions the adult female went through the motions of feeding the young, but had not response from the nestlings. 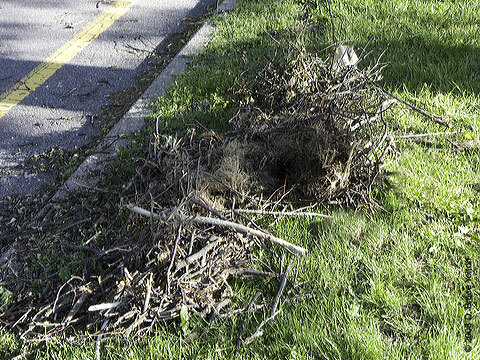 This nest which was typical of a young couple's first nest. 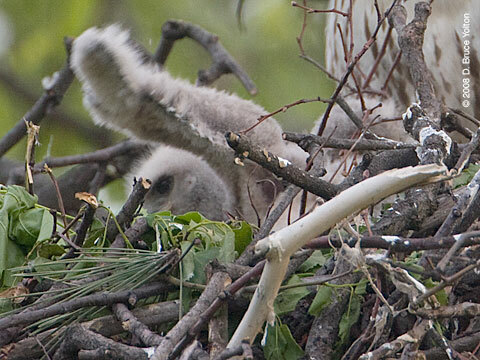 It was in a bad location, and on an unstable set of branches. 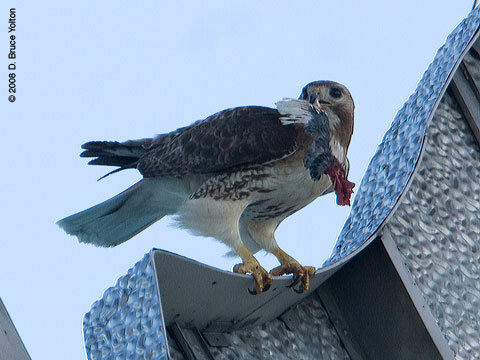 It always seemed like an accident waiting to happen. 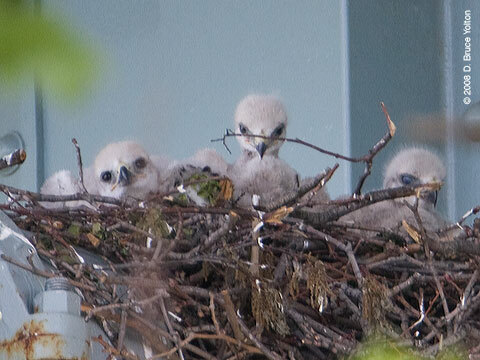 I hope our failure to see the eyasses today was only due to them being exhausted from the tossing and turning in the wind and rain on Friday, but I feel that something much worse may have happened. 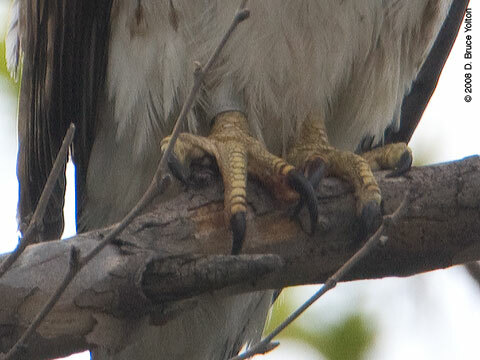 We should know more on Sunday. 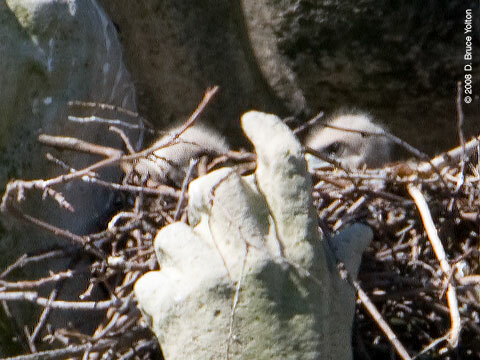 Update: On Sunday, the mother removed a dead eyas from the nest. 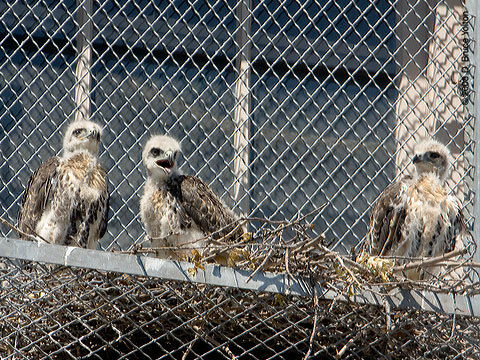 The eyas will be sent to Ward Stone at the NYS DEC to determine the cause of death. 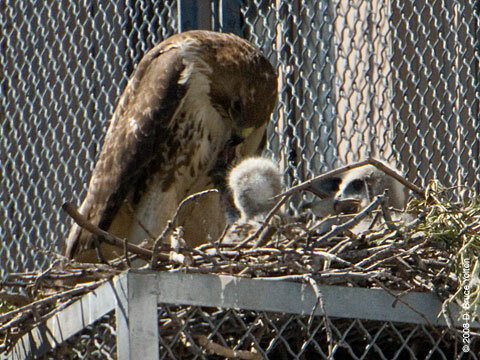 The other two eyasses are also presumed to have died as well. 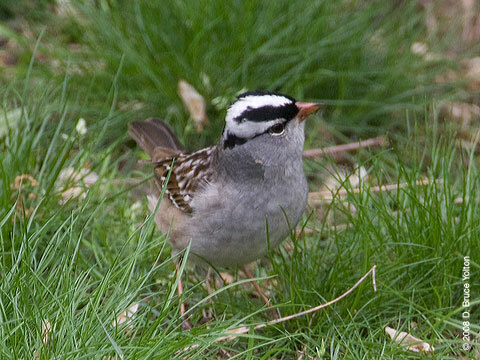 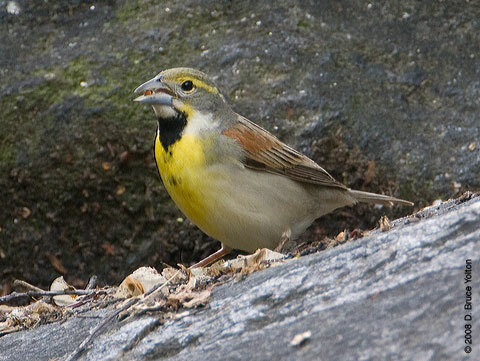 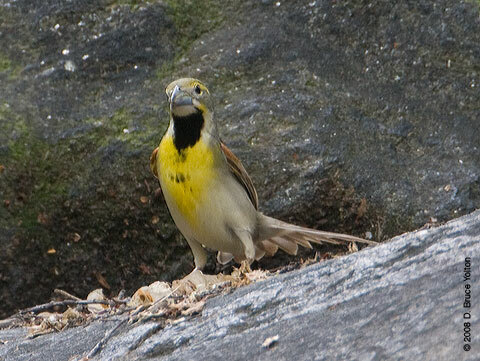 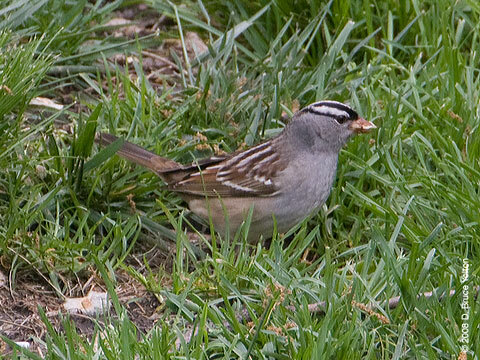 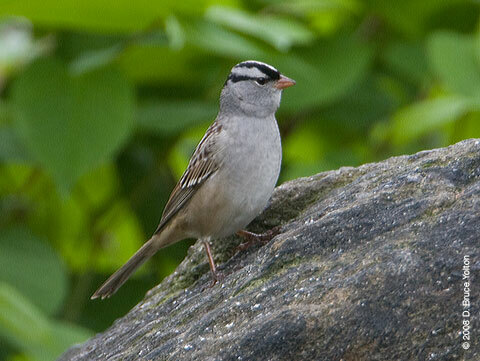 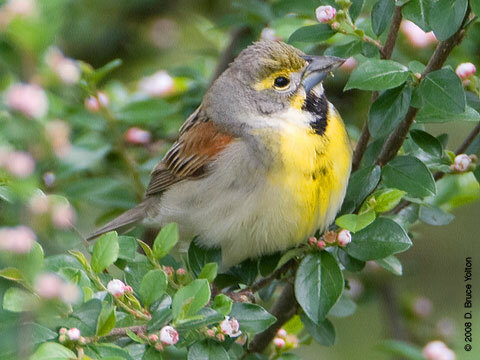 Falconer's Hill which is about a block west of Central Park West at 71st Street had a wonderful male Dickcissel and a number of White-crowned Sparrows on Saturday. 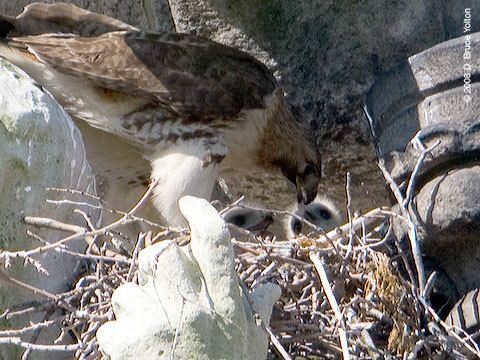 I couldn't stay long, so I missed seeing a feeding, but I did get to see all three eyasses at once. 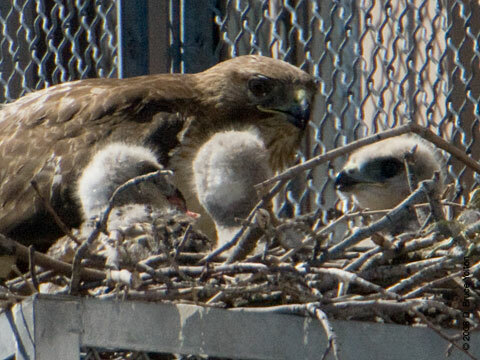 I wasn't imagining three! 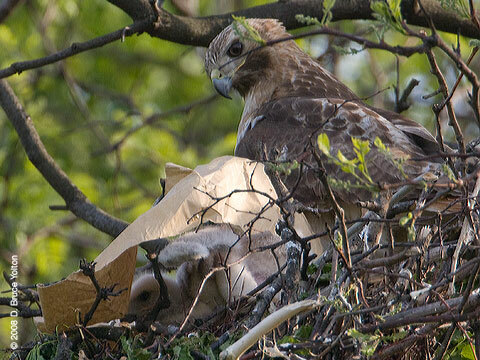 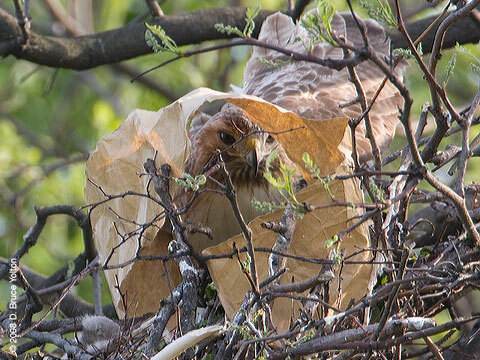 The hawks had brought a large piece of brown paper to the nest. 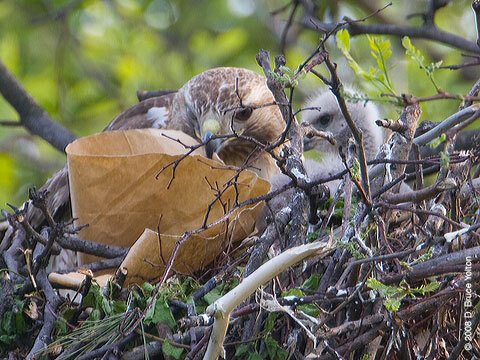 At first it was being used as a new lining for the nest, then it blew around some. 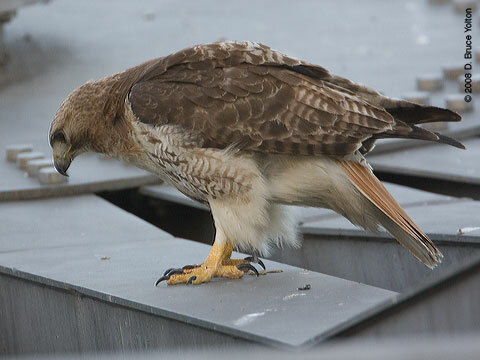 Then one of the eyasses used it as a toy. 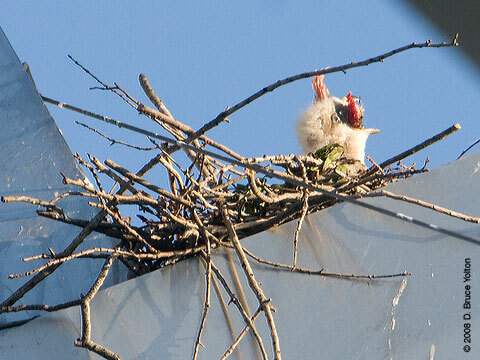 Eventually it became a sun shade, to block out the setting sun. 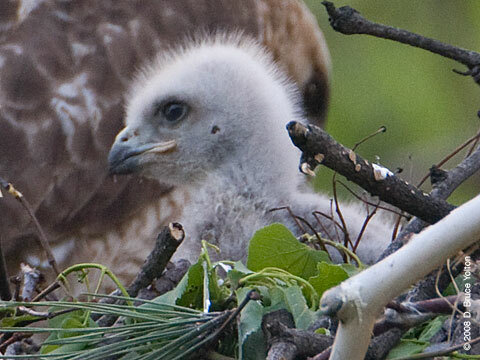 The eyasses are starting to loose some of their pure fluffy nature. 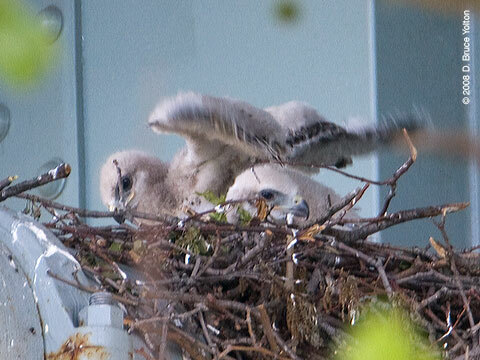 These photos show lots of early wing development. 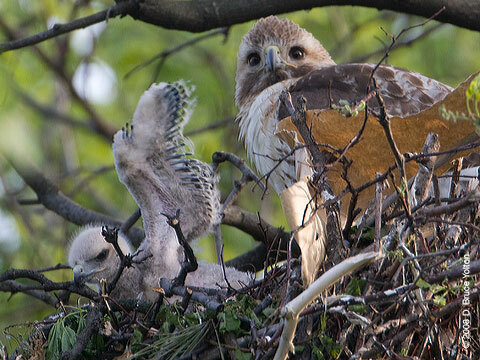 The young ones are big enough to spend some time jumping up now. 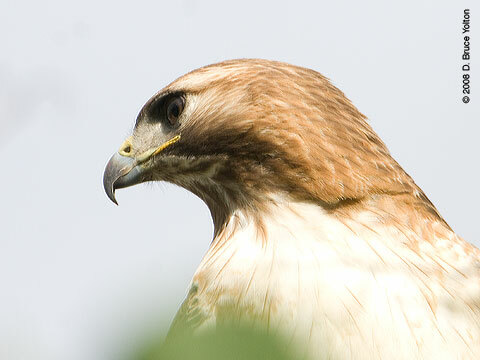 Bring some binoculars and enjoy watching them. 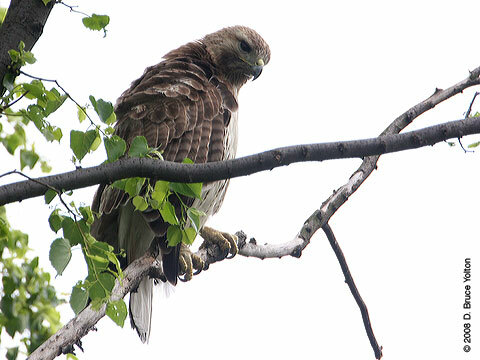 I got a note and a photograph from a fellow hawk watcher, Sam Fisher, who took a photograph of three eyasses about 45 minutes after I left this evening. 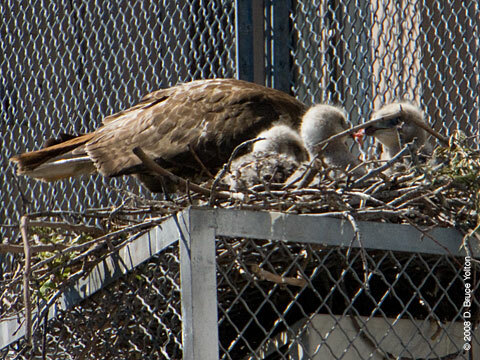 So it looks like we do have three kids after all! 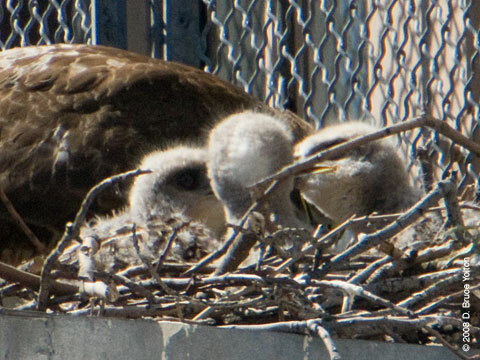 I may have counted the eyasses incorrectly at Riverside. 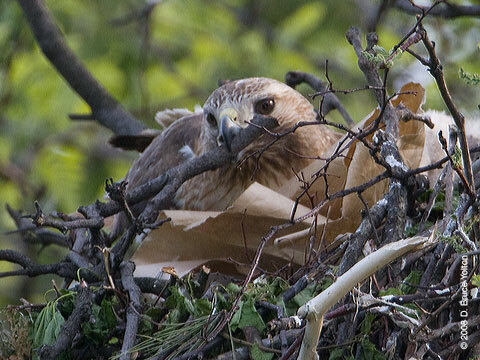 Both Saturday and Sunday, I only saw two eyasses on the nest. 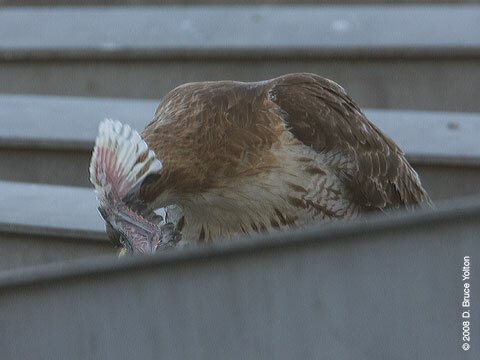 I went back to my photographs from Thursday, and it might be possible that I mistook a wing for a head in a few of the photographs. 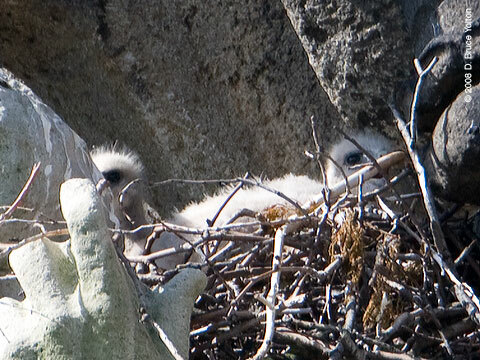 Until I see three heads for sure, I think it would be best if I revised my count to two, with a possible third. 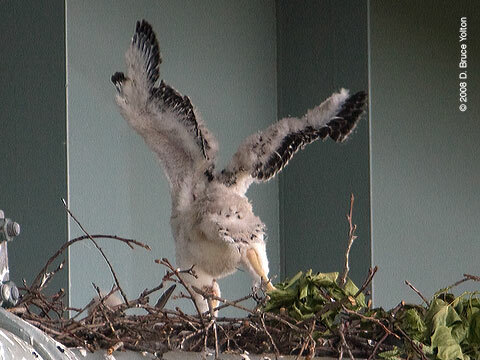 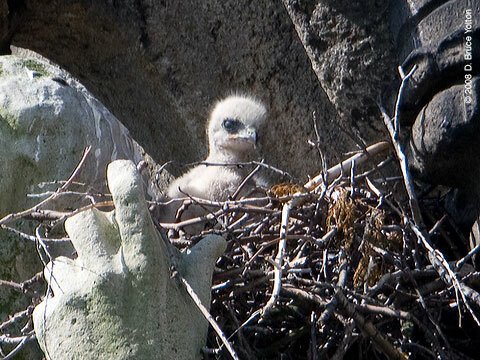 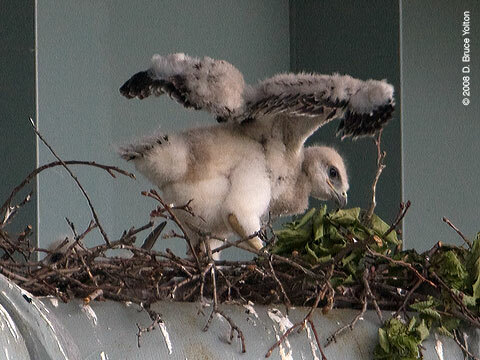 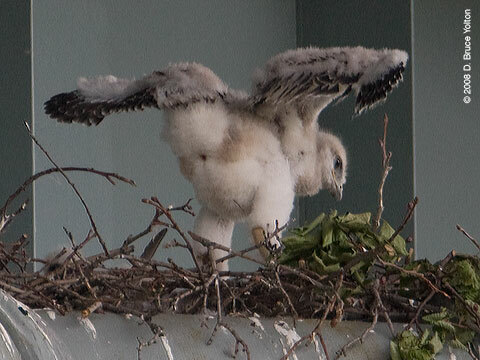 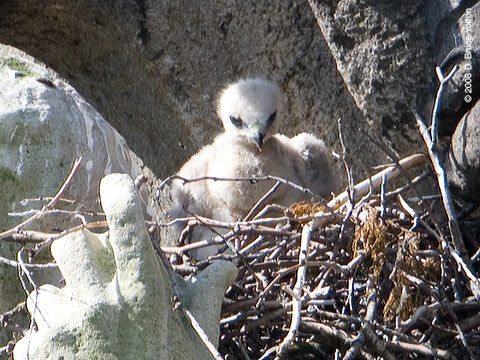 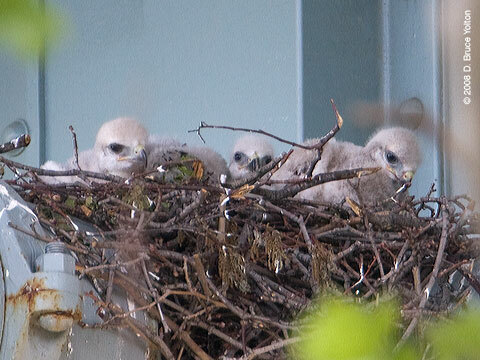 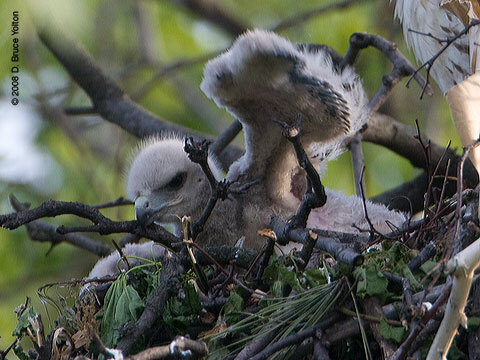 In any case, the warm weather and sunlight encouraged the nestlings to be very active on Sunday.